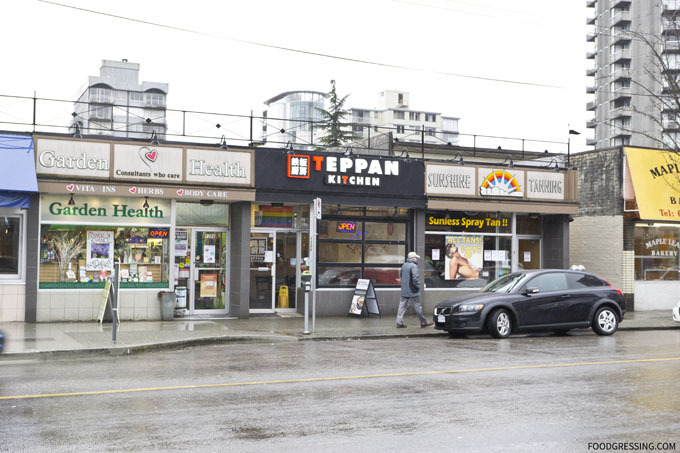 Teppan Kitchen opened their third location last September in Metro Vancouver at 1206 Davie Street. 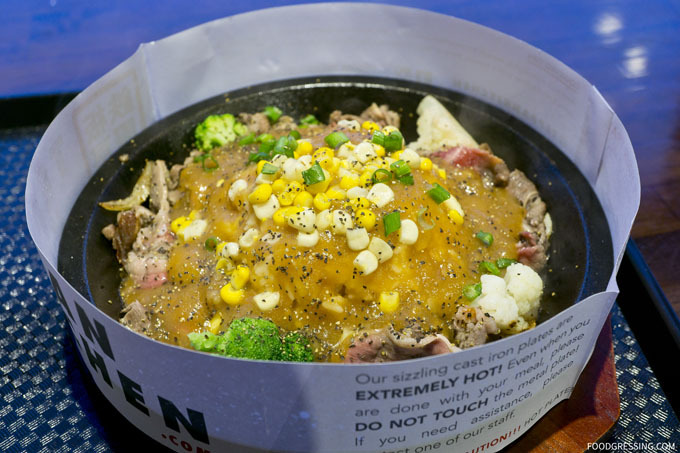 At Teppan Kitchen, it’s about Japanese-style, sizzling-plate teppanyaki meals at budget-friendly prices. 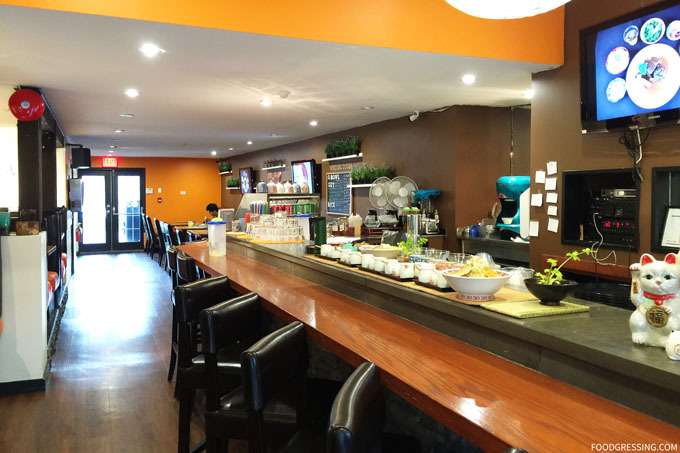 I am familiar with Teppan Kitchen having visited and reviewed their original Abderdeen Centre location and their newest Harbour Centre one. 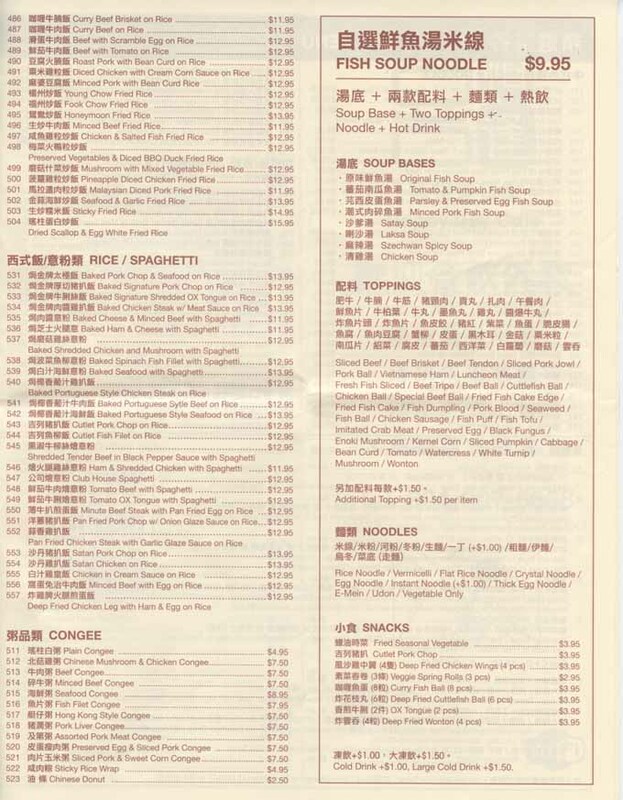 And when they opened up a restaurant in my neighbourhood, the West End, I was interesting in trying them out. 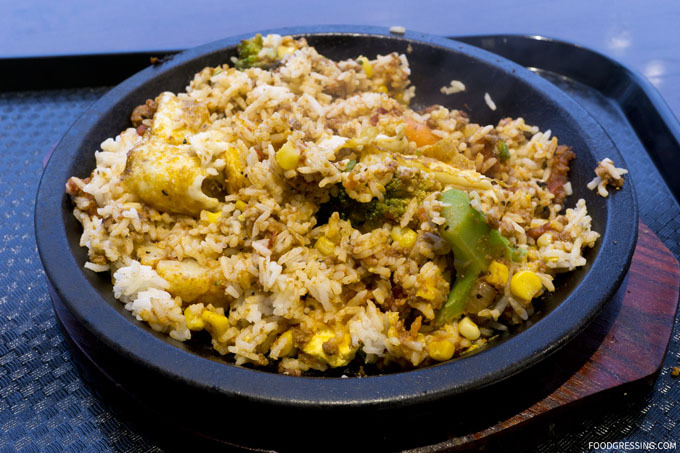 Teppan Kitchen’s entrees are primarily noodle and rice-based with different toppings. 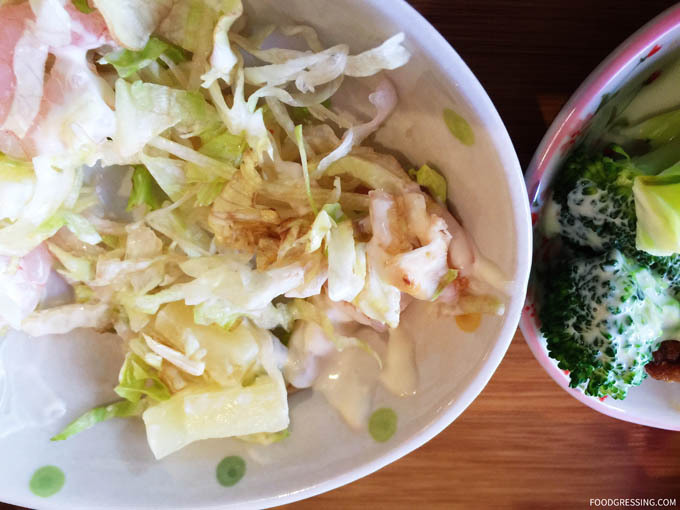 The entrees range from $9 – $13 and you can combo it up with a large drink and miso soup for $1.50. 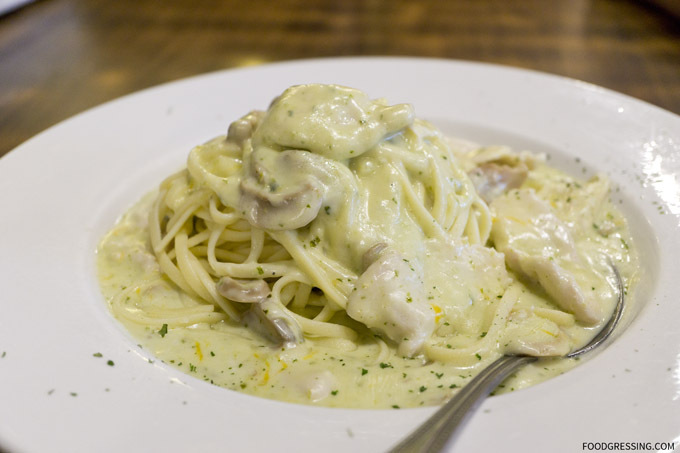 Some items offered are the A’ Grade Rib Eye Beef Teppan Rice, Smoked Salmon Pasta with Citrus Cream Sauce, and Seafood Pasta with Tomato Sauce. 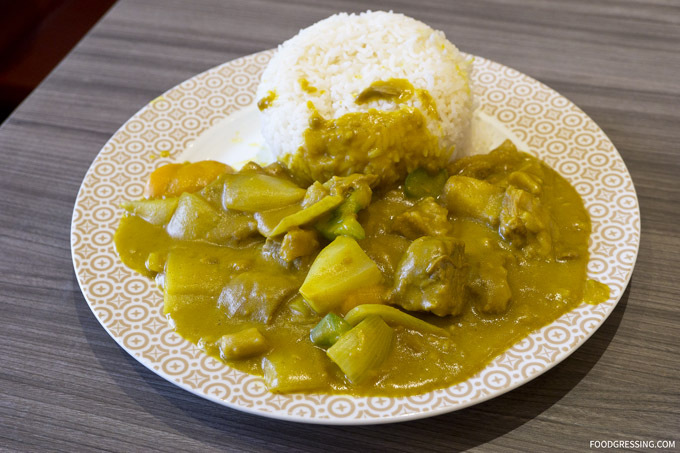 A few Malaysian-inspired options are the Curry Beef Brisket with Rice, Curry Chicken with Rice, and Seafood Laksa Noodle Soup. 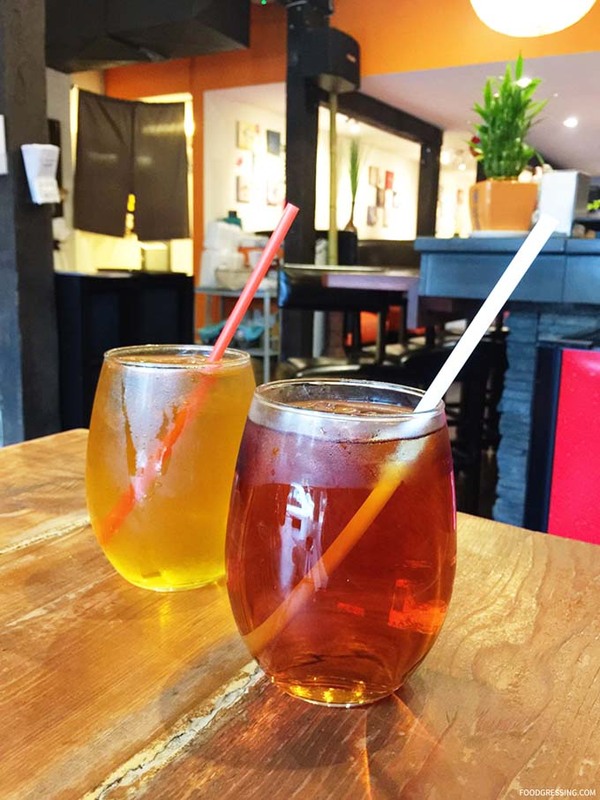 In terms of refreshments, they offered a variety of iced beverages like iced lemon tea, iced matcha honey green tea and more. 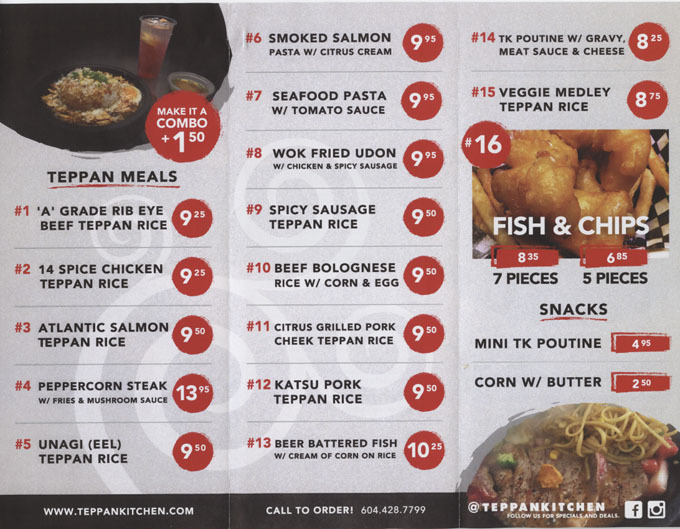 Having tried Teppan Kitchen’s other locations in the past, I have a few favourites from their menu. Although their food is simply fast-food, I find that it’s just what I need sometimes for a quick lunch to fuel me for the afternoon. 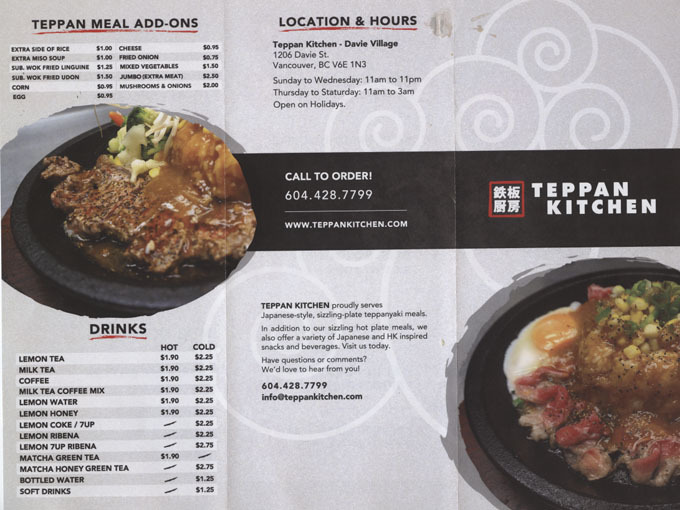 On my first visit, I went with the A’ Grade Rib Eye Beef Teppan Rice ($9.25). It has a bit of peppery and smokey flavour to it. There’s lots of sauce and it’s nicely buttery. 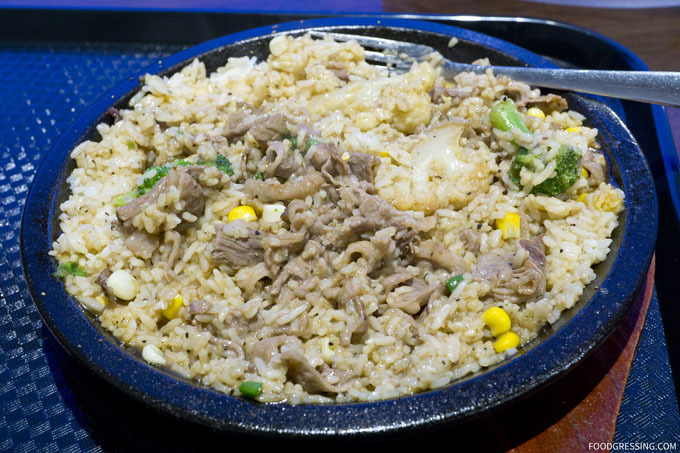 The corn adds a bit of a sweet taste and the meat is tender. One of my favourite Teppan Kitchen items. 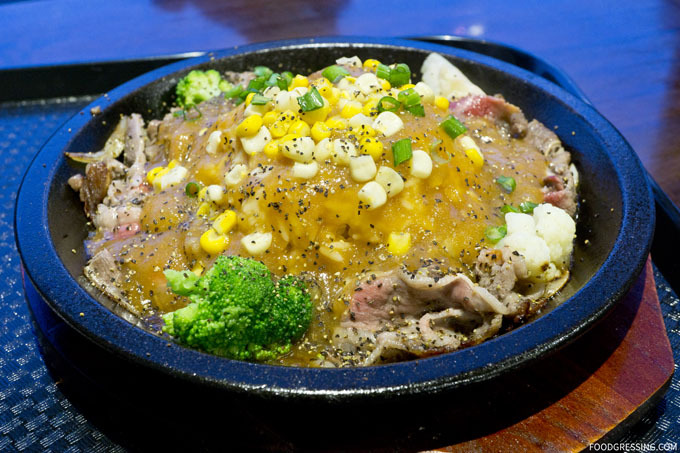 The food on the griddle is partially uncooked when it arrives at your table. You just need to stir in all the ingredients and wait for it to cook for a few minutes. In this sense, it’s fast food where you get to do a bit of cooking yourself! On a separate visit, I went with the the Beef Bolognese Rice with Corn & Egg. It’s essentially meat sauce on rice but I find it quite tasty. The taste is a bit on the sweeter side. 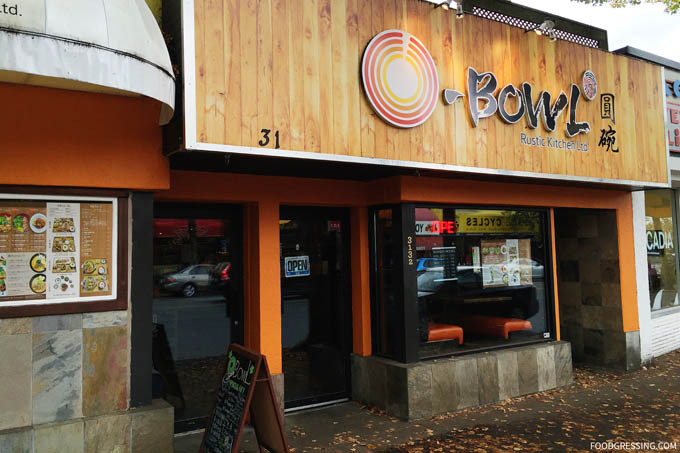 This past June, Kitsilano welcomed a new Asian restaurant in the neighbourhood, O-Bowl, at 3132 West Broadway. 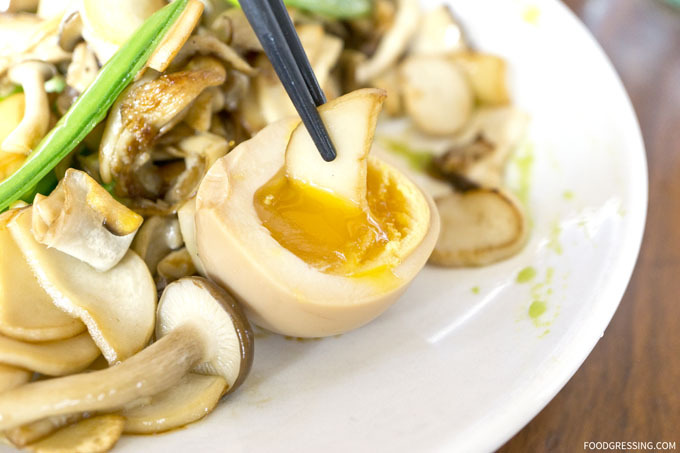 O-Bowl serves Asian-inspired dishes with culinary influences from Taiwan, China and Japan. 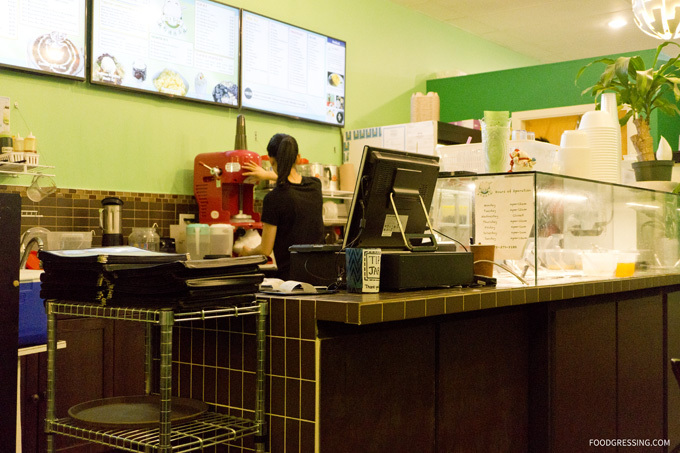 The owners of O-Bowl are not new to the restaurant industry; they also own Sugarholic Cafe, an afternoon tea spot in Richmond’s Aberdeen Mall. 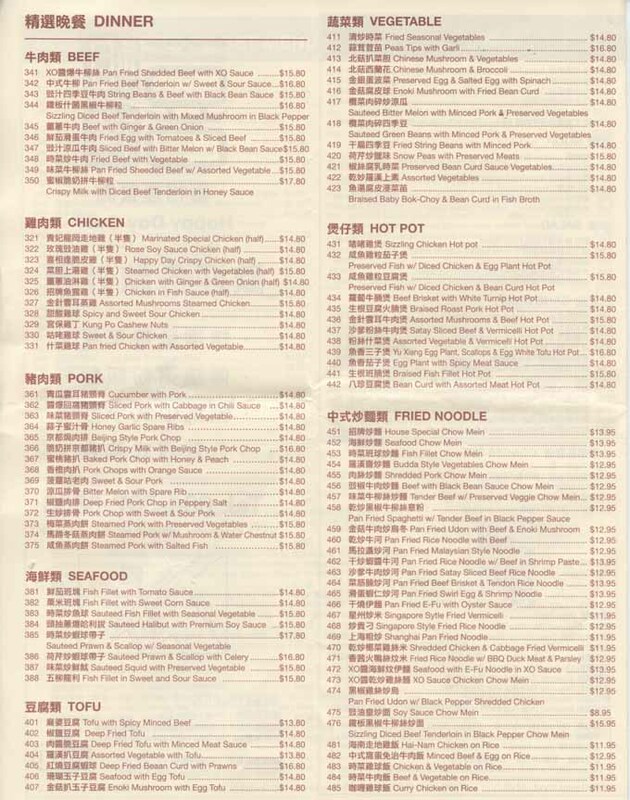 I learned about O-Bowl through their Axka.com deal which was a Taiwanese Stir Fry combo for $20. I purchased the deal and tried out O-Bowl a few weeks ago. 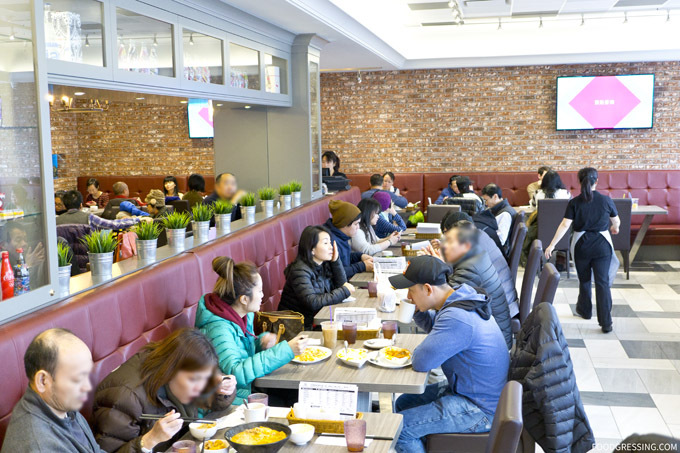 The interior of O-Bowl seems to be somewhat Asian rustic-inspired. 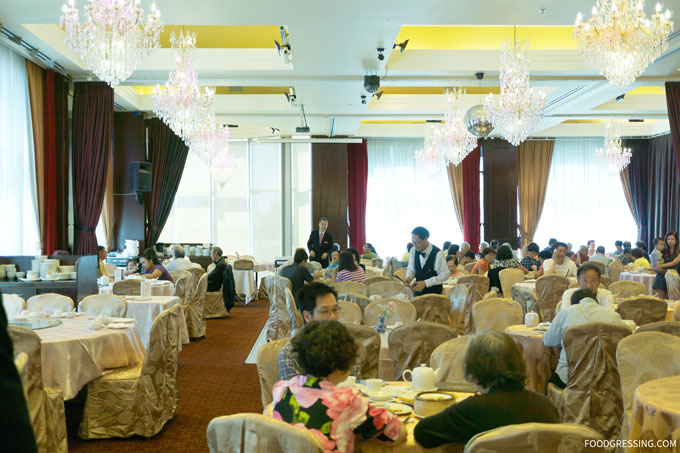 There are booths, a very long counter by the bar and dining tables. 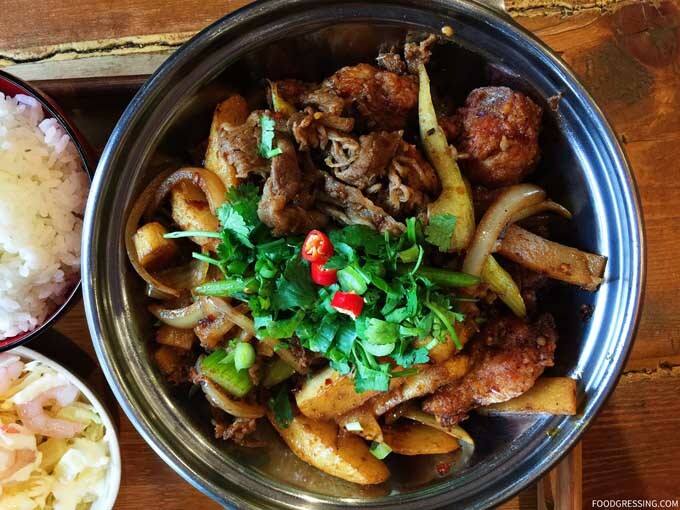 On the menu are rice bowls (wasabi beef, spicy tofu, mango curry chicken and more), stir fried pot (choice of beef short rib, chicken wings, beef or seafood) and noodle dishes (scallion short rib, laksa curry short rib, butter miso short rib and more). 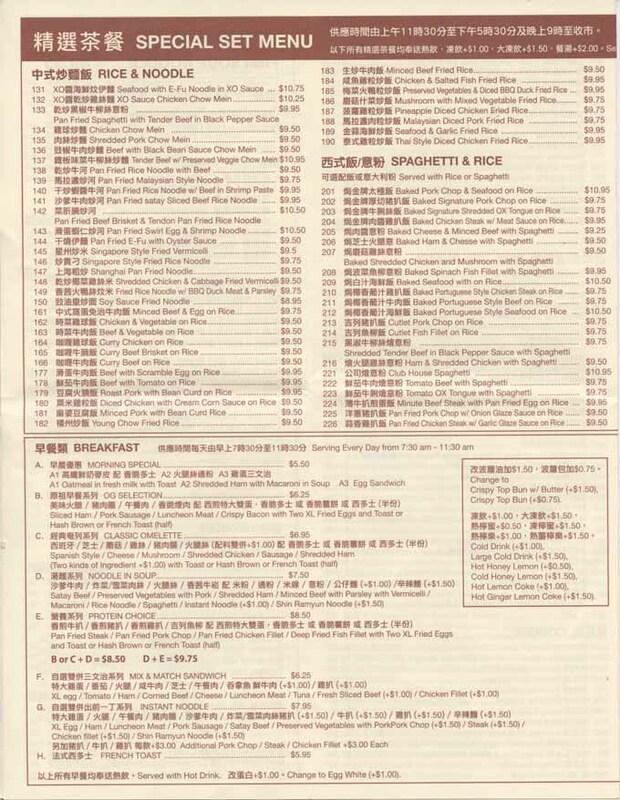 Appetizer options include pumpkin croquette, fried jumbo prawn, chilled tofu and more. 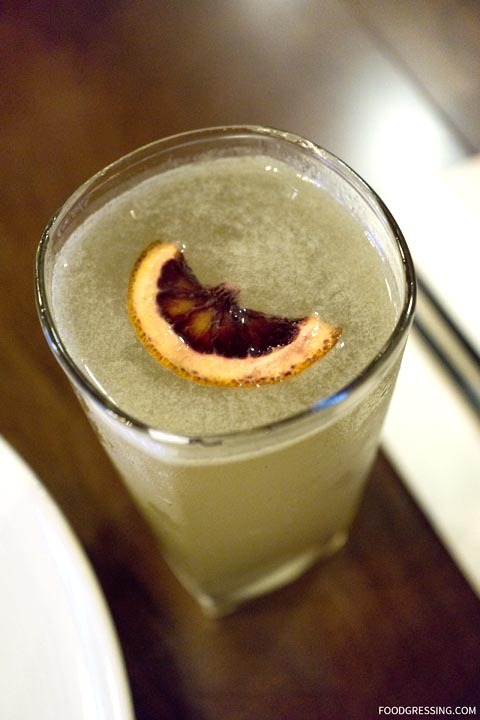 They also serve a variety of flavoured sparkling water drinks such as rose lemon or pineapple ginger. 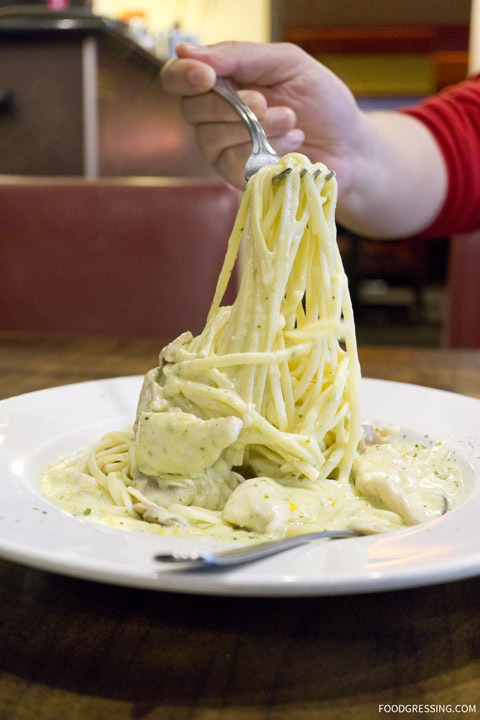 Photos of their menu can be found on Facebook. We went with passionfruit and oolong teas which had reasonable tea flavour. Then came our combo served on a bamboo tray. To start, the cold appetizers were mediocre at best. 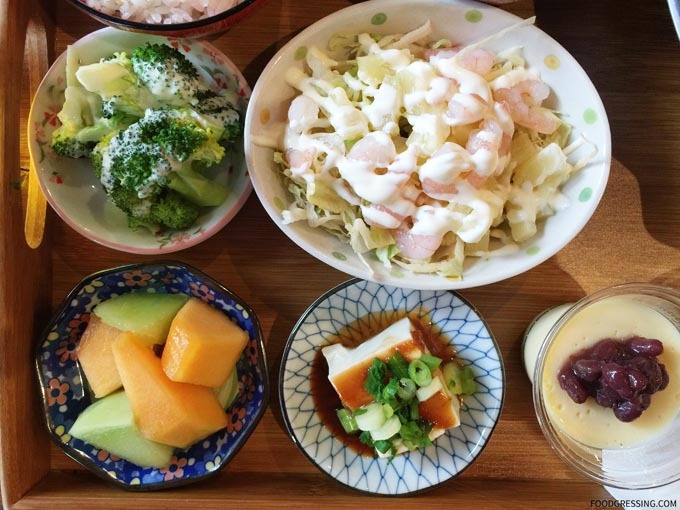 There was broccoli with mayo, shrimp salad, fruit salad and Japanese cold tofu. The brocoli with mayo wasn’t particularly appetizing. The fruit salad didn’t appeal to us. 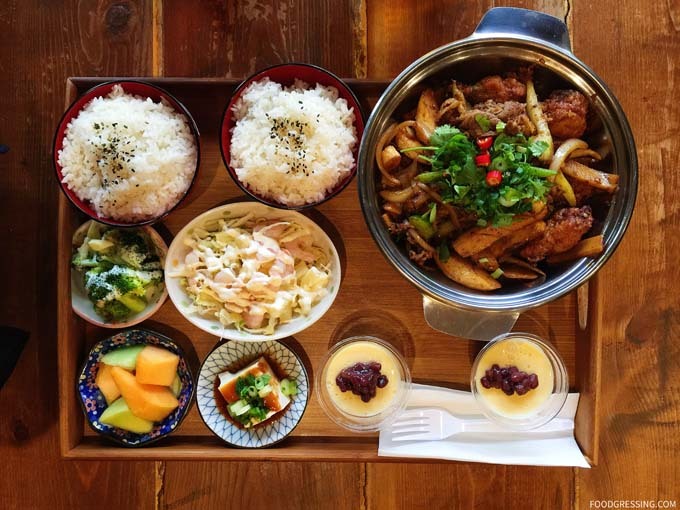 The Japanese tofu was the best of the lot – the tofu seemed reasonably fresh. Nice subtle flavour from the soy sauce and green onions. The worst was the shrimp salad because of the brown and wilted shredded lettuce. Really unacceptable. Despite the appetizers which were really well..unappetizing, the stir fry was actually delicious and packed full of flavour! We went with the chicken legs, beef and I paid extra to have fish tofu added. The chicken meat fell off the bone nicely and the beef was tender. The fish tofu was firm and tasty. I’m not sure why they call it a Taiwanese stir-fry because the flavours were closer to Szechuan just milder. There were actually Szechuan peppercorns in the stirfry. 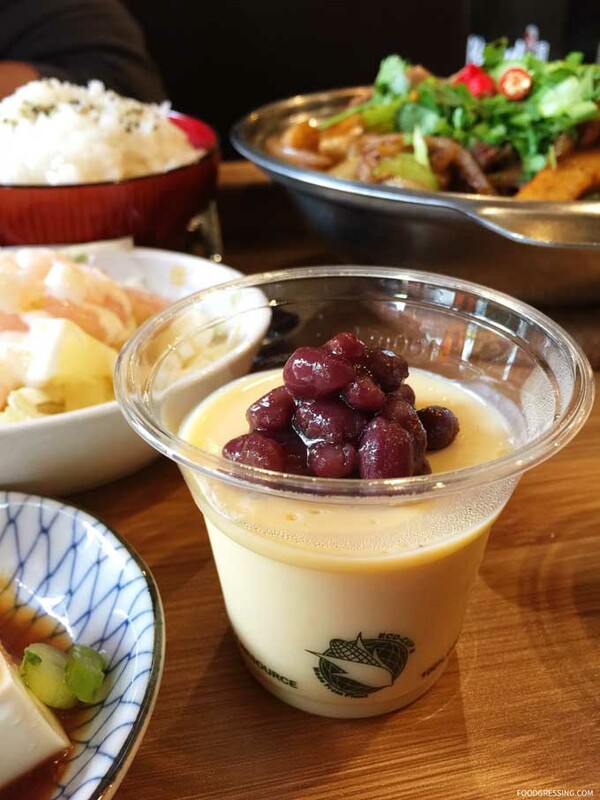 Lastly was the red bean pudding which seemed more like a custard. Light and refreshing, it was good but not amazing. I didn’t mind it but I wouldn’t ask to have it again. 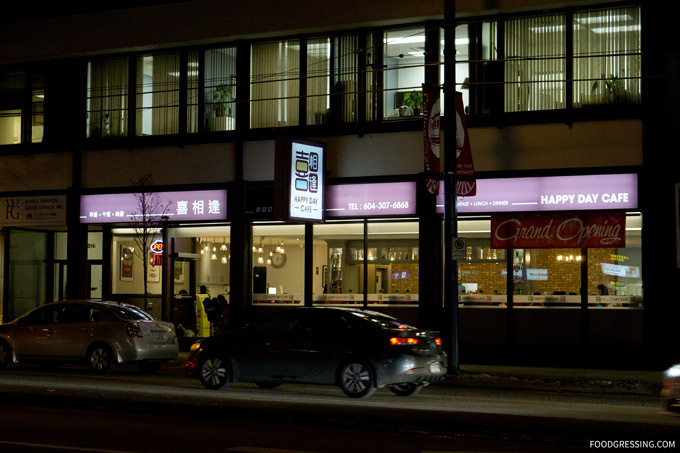 The Marpole area has quite a few Asian restaurants but there aren’t any bubble tea shops (local or international chains). 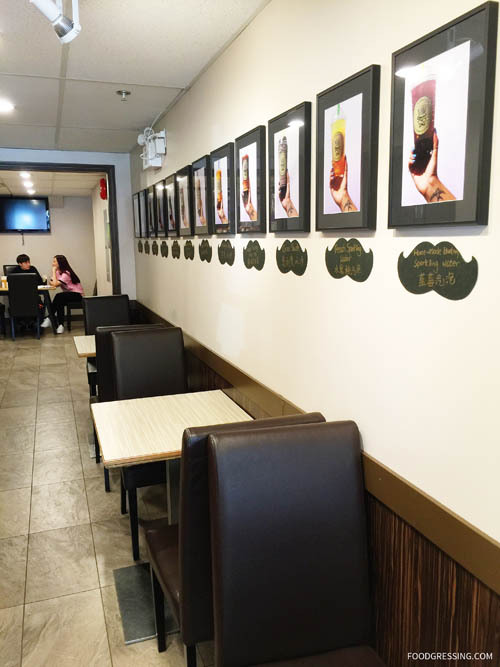 However, a newly opened bubble tea house is filling the void. 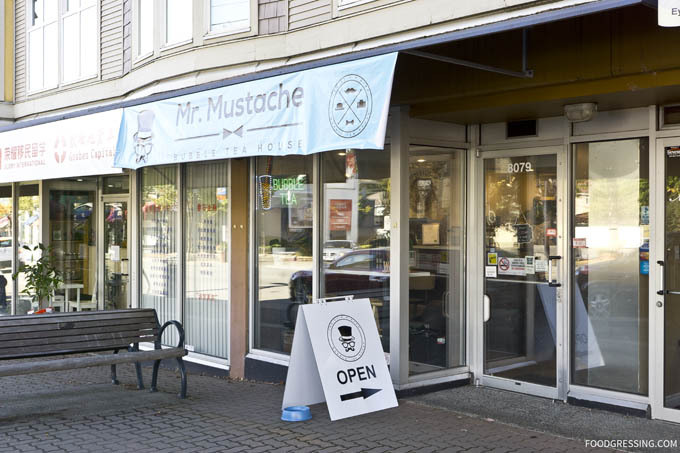 Located at 8079 Granville Street, Mr. Mustache Bubble Tea opened at the end of August and is serving up bubble tea and fresh fruit drinks. 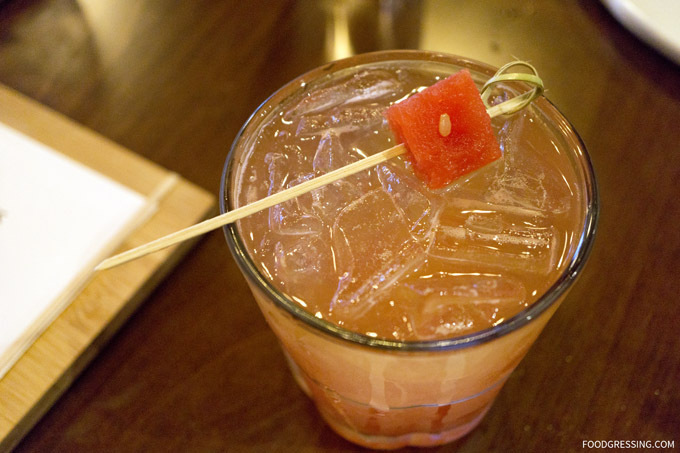 Open from noon to midnight, this new drink shop might be a nice little late night stop. 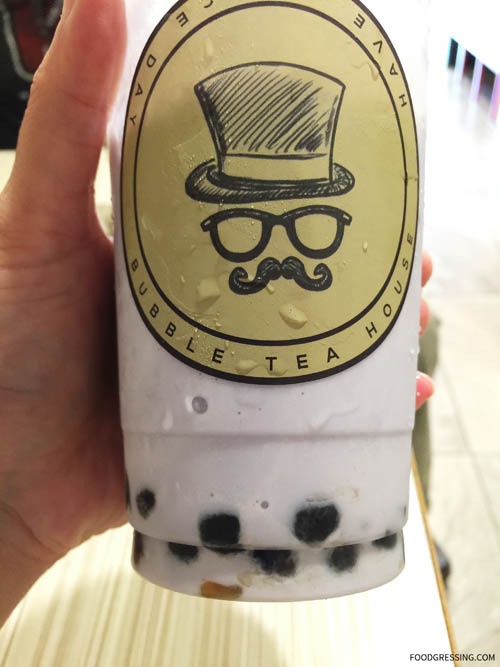 After looking at their Yelp page, I learned that Mr. Mustache is owned and operated by a young man named David who worked at bubble tea shops while growing up. After graduating from university, he decided on a career in investment banking. 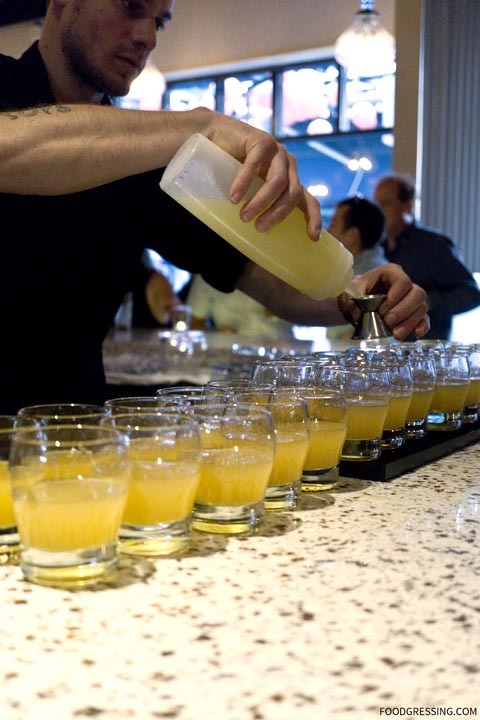 David ultimately realized that it was not his dream job and decided to pursue his passion of making delicious drinks for people to enjoy. 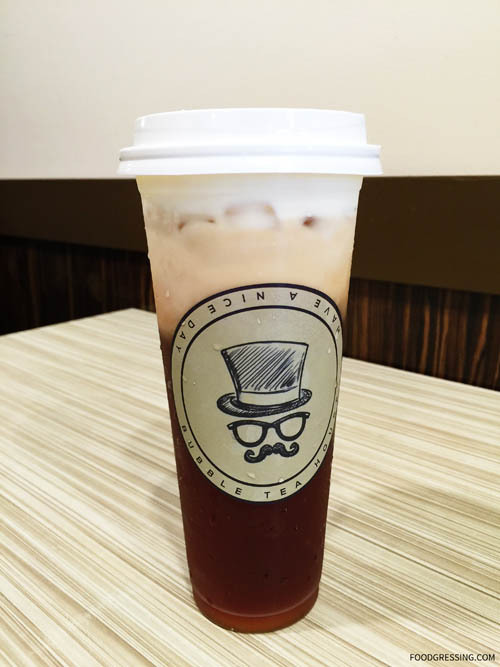 I first came to know about Mr. Mustache through their Axka deal where you can enjoy any drink for $3. This past weekend, my family and I paid a visit to them and tried a few of their drinks. The interior of Mr. Mustache is rather minimalistic but has a nice mix of seating options. 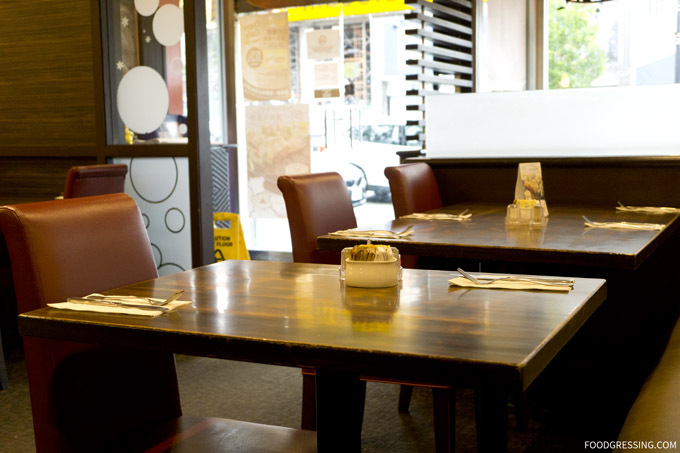 There are a few two-person tables, a small round table, counter seating by the window and one larger table at the back of the shop. 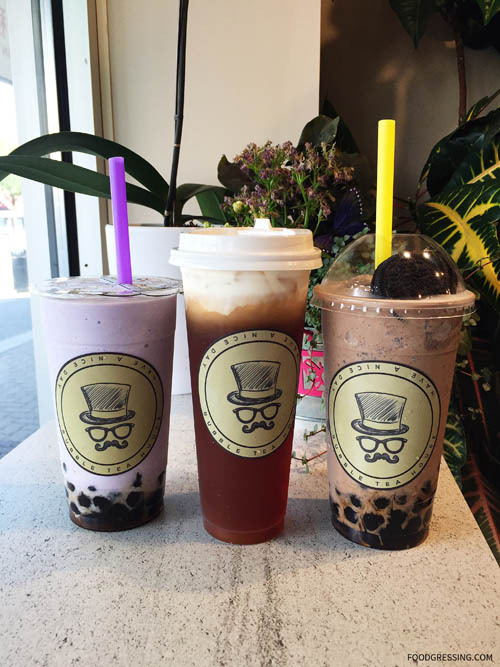 A variety of beverages are served at Mr. Mustache including macchiatos, black/green tea-based, milk tea-based, slushes, and sparkling teas. 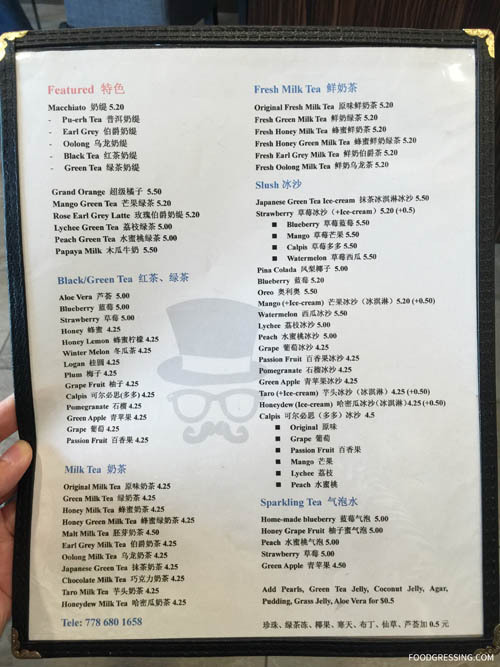 Drinks are around $4-$5 which are comparable to Chatime but more expensive than Bubble World. The Taro Slush with Ice Cream had a nice taro flavour and was reasonably thick in texture. 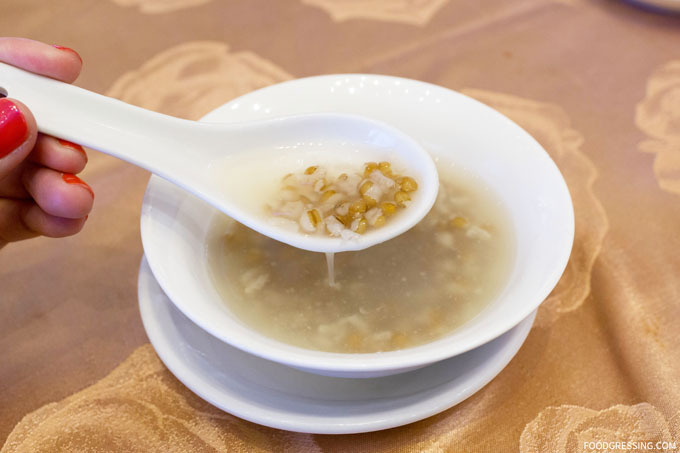 The tapioca pearls were excellent: smooth and slightly soft on the outside, but chewy through to the middle with a slightly increasing level of firmness. The Oreo Slush was definitely better than expected. 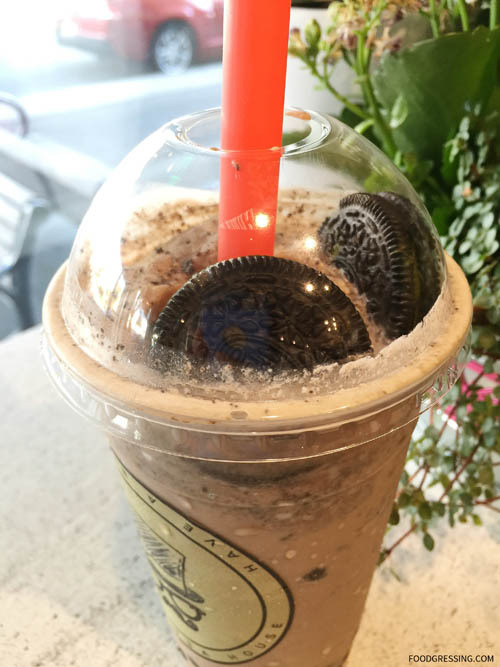 The drink was primarily made of crushed Oreo cookies but topped with two intact ones on top. I thought it would have tasted excessively sweet due from Oreo bits but this was not the case. 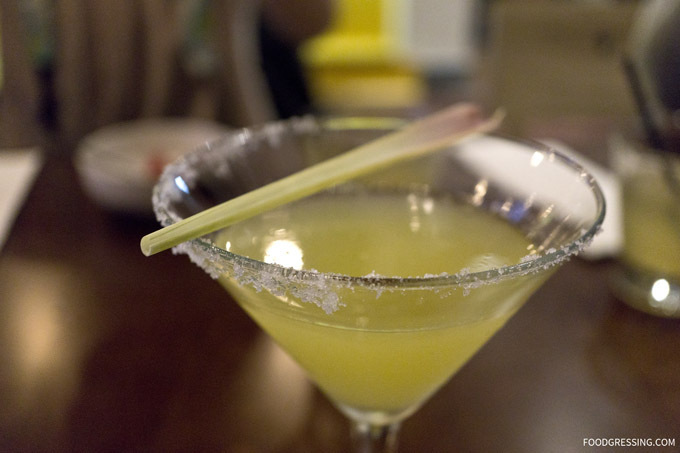 I quite enjoyed the cookie bits within the drink which made it a texturally a fun drink to have. Macchiatos are feature drinks at Mr. Mustache and I quite liked the ice cold Earl Grey Macchiato. Very nice Earl Grey flavour with a layer of milk on top. The interesting part was that the milk was a bit salty, which David had informed me beforehand. 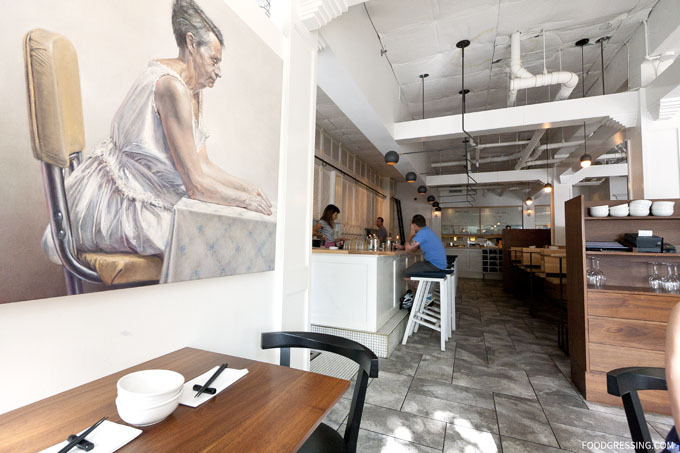 PiDGin made quite a splash when they entered the Vancouver dining scene in 2013. 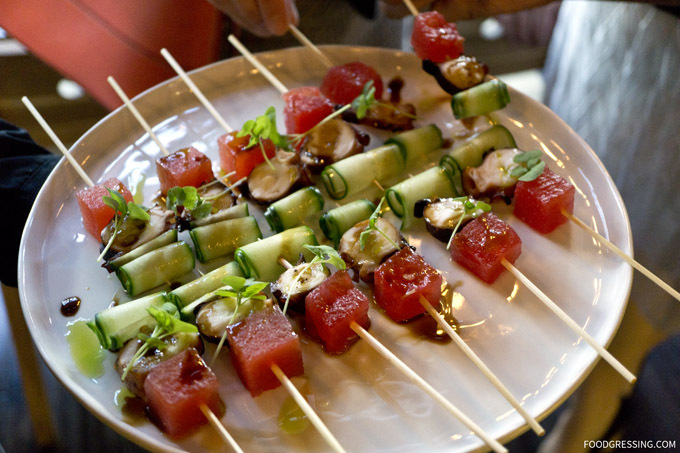 It’s not quite fine dining but definitely an upscale restaurant serving innovative French and Asian fusion cuisine. 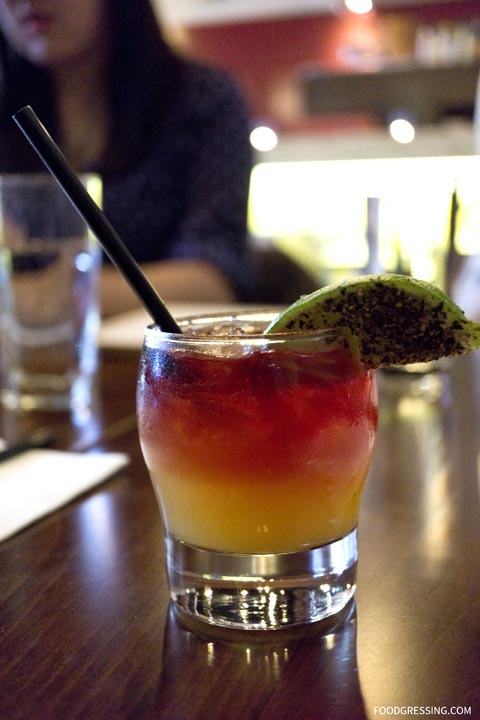 While their uniquely crafted dishes and cocktails generated much buzz, they also caused quite a stir by opening their doors in the Downtown Eastside (DTES) at Carrall and Hastings. 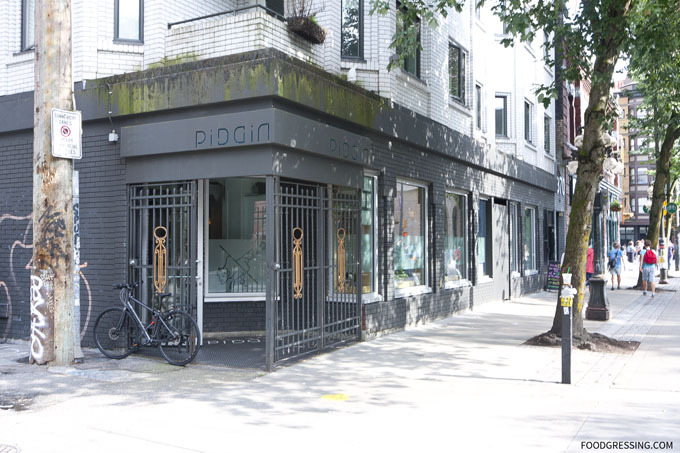 PiDGin’s early days were marred with protests by anti-gentrification activists and DTES residents who made it loud and clear that PiDGin was unwanted in the area. 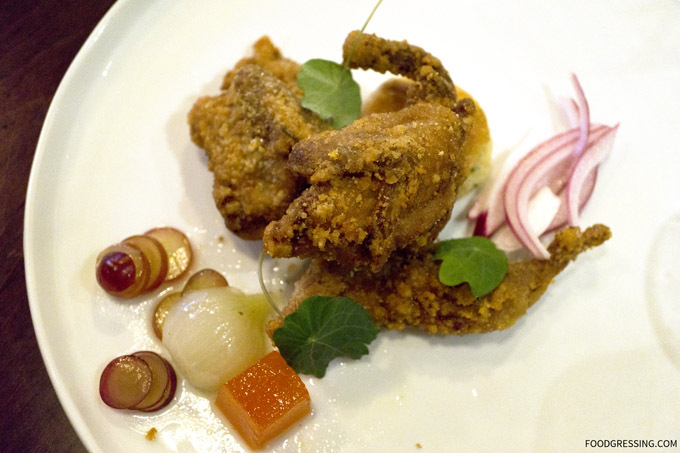 Fast forward three years, PiDGin still exists and attracting foodies around. 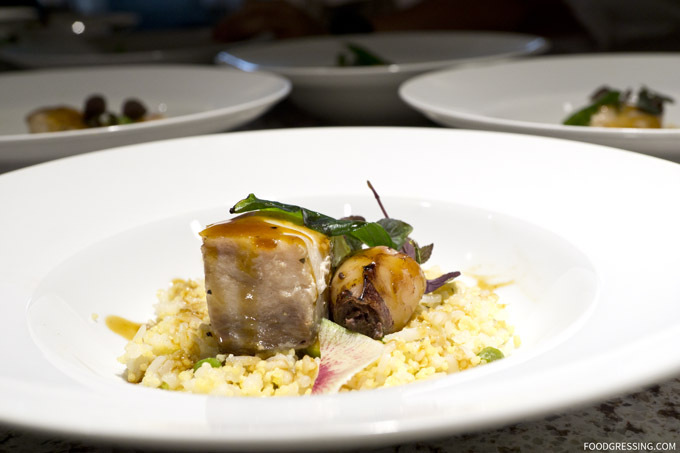 Recently, I saw that they had a Travelzoo deal for their 8-course tasting menu. At $66 for two people, it was a steal compared to their regular price of $55 per person. 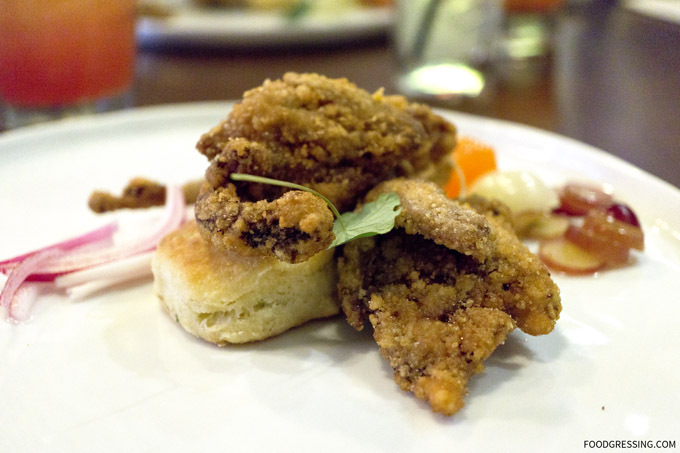 I snapped up the deal and my husband and I visited PiDGin for date night. We were the first customers that night and got to admire the beautiful interior without people in it. With soft lighting coming through the windows, the ambiance was very zen. One side of the room had wooden dining tables and benches while another side had the bar and elevated booths. We sat at a two-person table along the window with me on a cozy banquette. A few of their art pieces seemed interesting including an older woman siting on a chair. 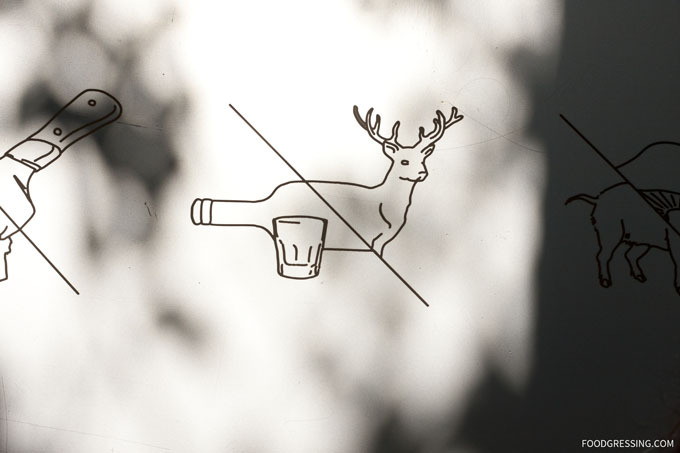 Then there was a “no deer no beer” (?) caricature. Deep. 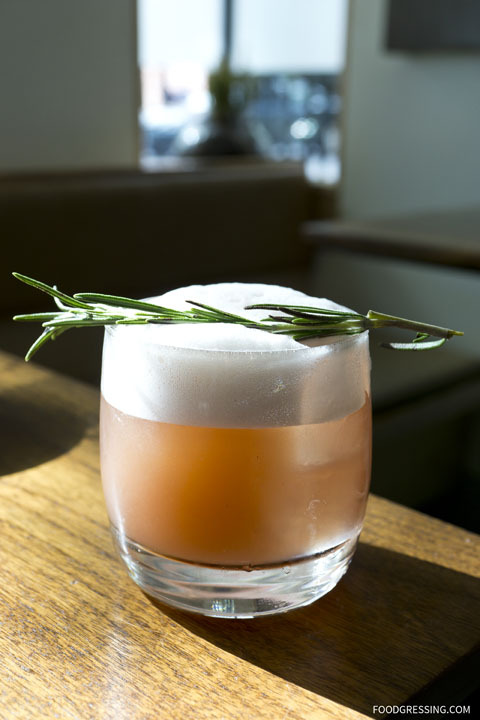 To start, we had the Purple Unicorn, a refreshing citrusy concotion of smoked plum cranberry, lemon, rosemary, and egg white. 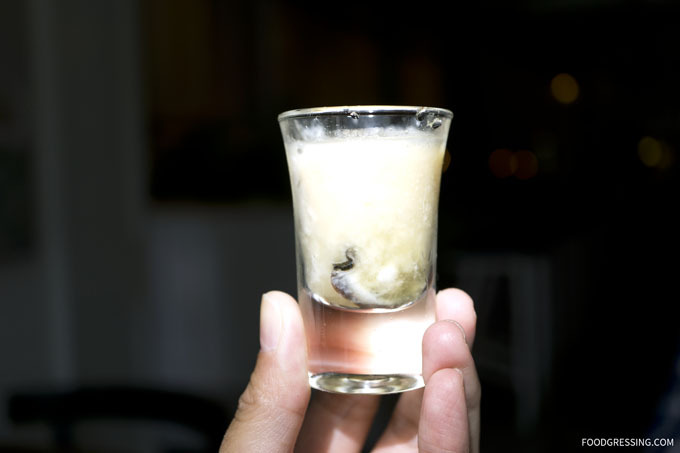 Then came our firsr appetizer, an Oyster Shot, consisting of a shucked oyster with apple granita and horseradish. We were advised by the server to stir the contents to break open the oyster belly. The resulting mixture was silky in texture and had a mix of sweet, briny and spicy flavours. The spicy wake-up call made it an interesting start to the meal. 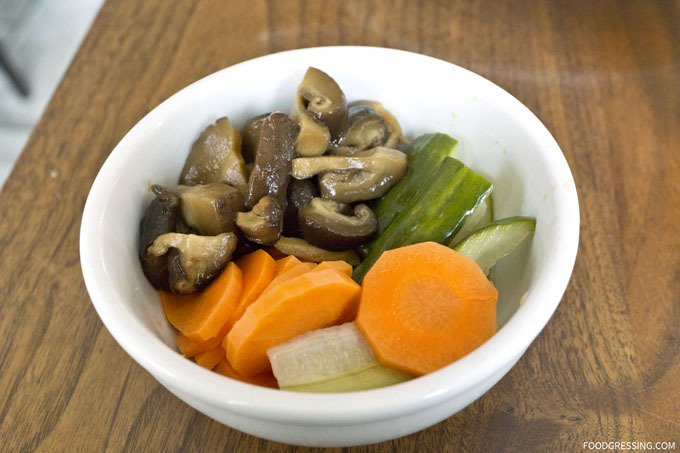 The Daily Pickled Vegetables were crispy, tangy, and vinegary. To me, it was the least interesting dish of the 8-course meal. 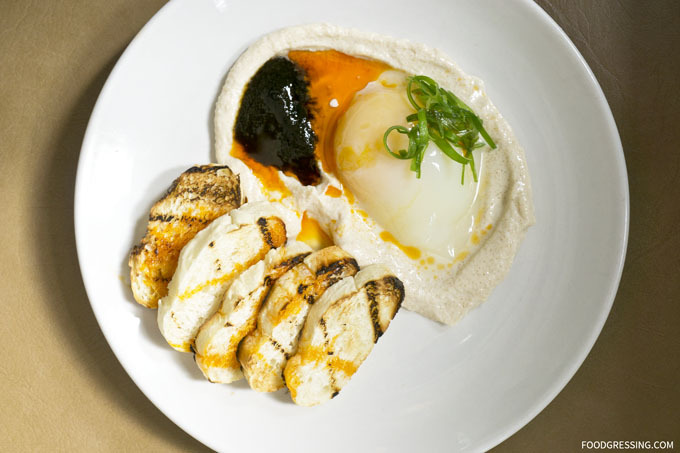 The Smoked Taramasalata, Nori Paste with Onsen Egg was the most interesting dish to eat. You needed to mix it all together to create a dip for the grilled bread. The resulting dip was very rich, creamy and savoury. Taramasalata is a Greek dip traditionally made with fish roe but this overall “mix” wasn’t fishy at all. 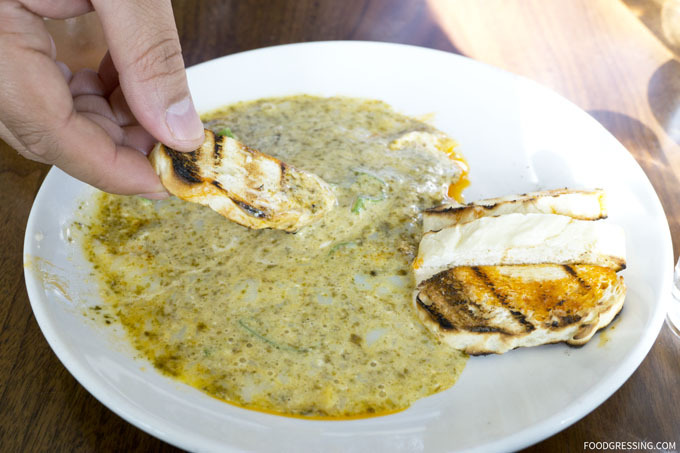 The dip was indeed very good and we soaked it all into the five pieces of grilled bread that were given. In the end, we still had an excess amount of dip so the server asked if we wanted more bread. We agreed to it only to discover that it costs an additional $2 when our bill arrived. Just beware that they do not let you know beforehand! 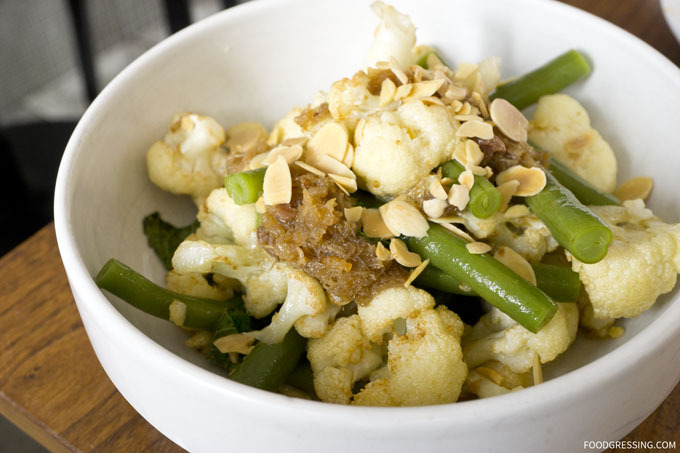 The Green Beans, Cauliflower with Homemade XO Sauce and Almond Toppings was simple and oh-so-delicious. 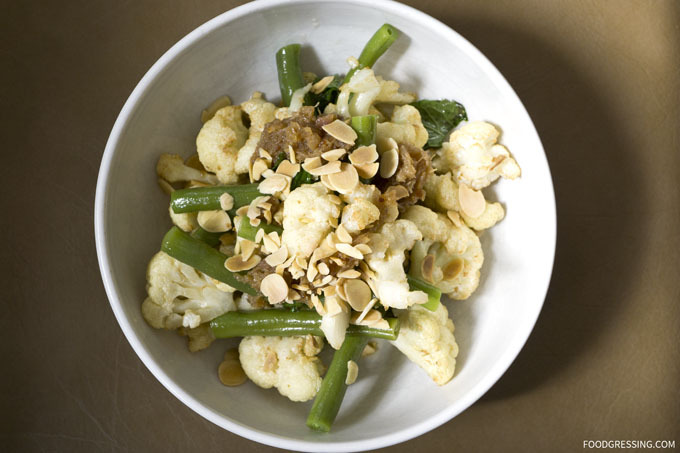 Those vegetables were perfectly crispy and the almonds gave the dish a wonderful crunchy contrast. 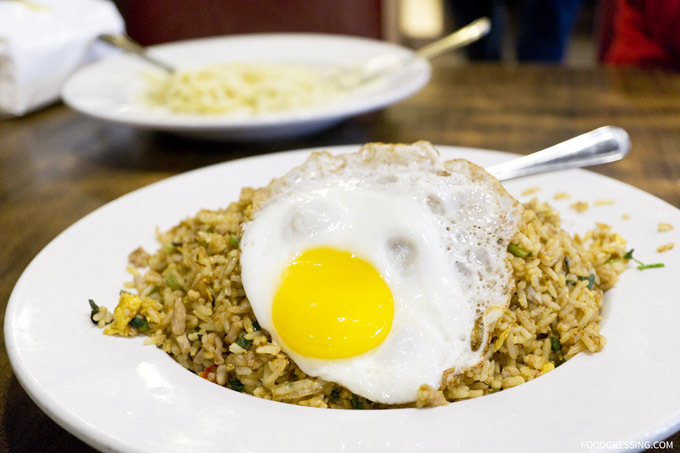 The XO Sauce made it a more Asian-inspired dish. 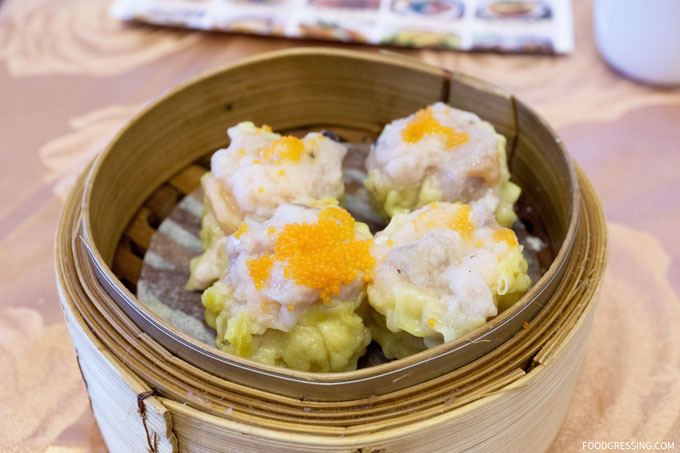 Sea-saltiness with a gentle spicy kick and some sweetness that rounds out the umami flavour. 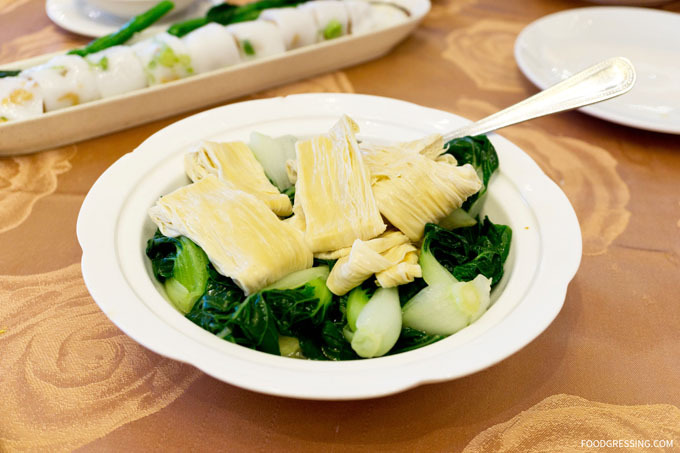 I think the dish was best enjoyed with a spoon rather than chopsticks because you could pick up a bit of all the ingredients. Easily my favourite dish of the evening. 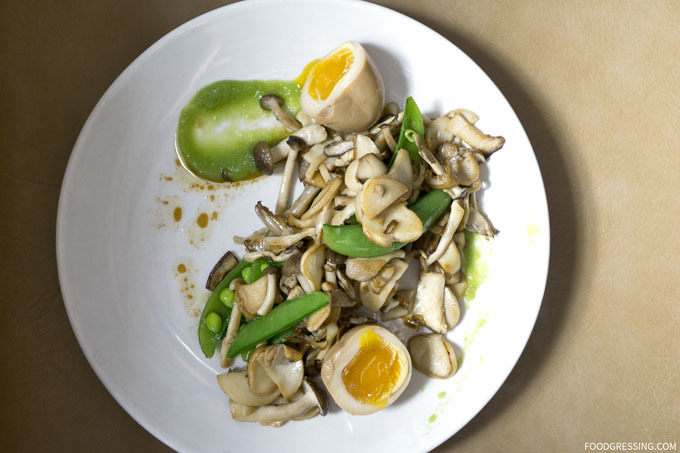 The Mushrooms, Snap Peas, Egg in Soy Yuzu Brown Butter was also a winner in my books. 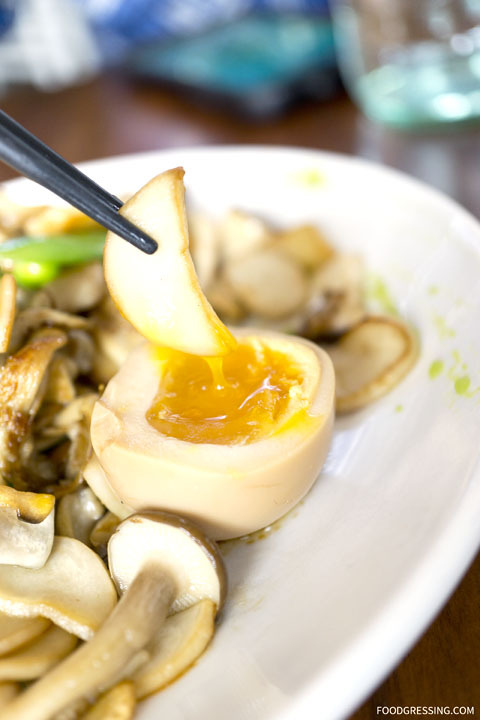 The concept of this dish was to dip the vegetables into the ramen egg. In the end, we thought it took too much time to dip the vegetables, which tasted good already on their own with their gentle coats of butter. 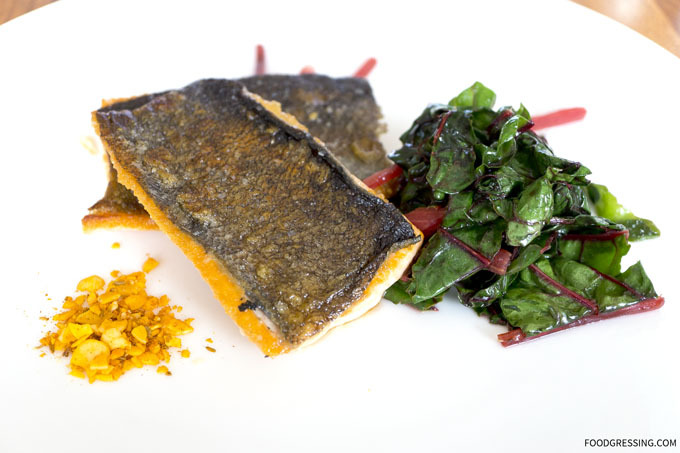 On to the entrees now…first up was the Pan Seared Trout, Bonito Buttersauce, and Swiss Chard. The trout was well-executed being lightly salted, moist and flaky while the skin was delightfully crispy. The swiss chard added a bit more flavour to fish. 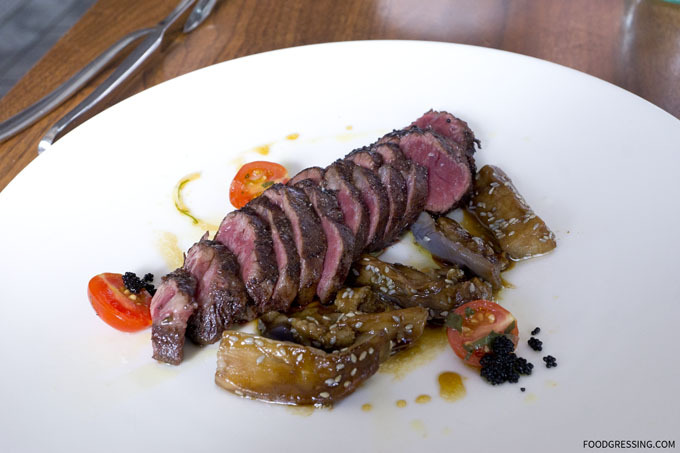 I preferred the Pan Seared Trout over the Bavette Steak, Wakame Caponata, Smoked Black Tobiko, however. The steak was served medium rare and was very tender, but that crispy trout skin had me at first bite. To finish off our fantastic meal was the Black Sesame Cake with rhubarb mousse, rhubarb pieces, raspberry sauce and white chocolate. 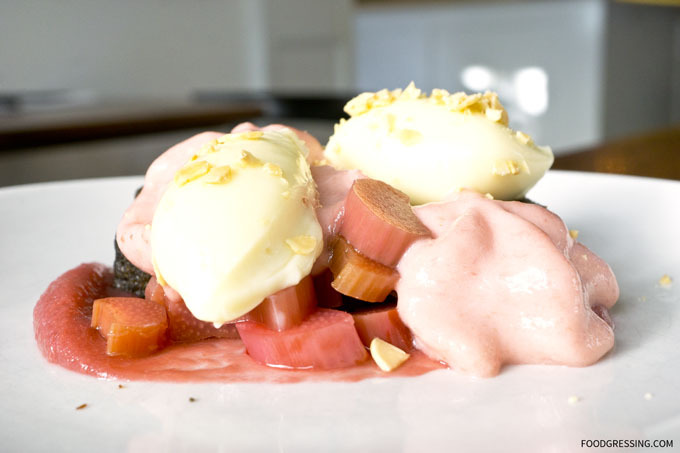 The dessert had a mix of sweet and tart from the rhubarb then rich and creamy from the white chocolate. Our 8-course meal took 2 hours and the service was very good despite the automatic 18% gratuity incurred as noted on the voucher. The flow of the meal was on point and we didn’t wait too long between courses. 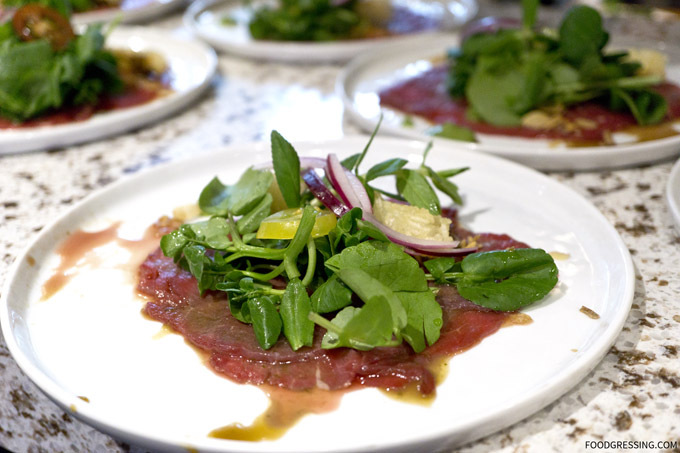 Disclosure: I was invited to a media tasting organized by SophiaEats.com where all food was complimentary. All opinions are my own. 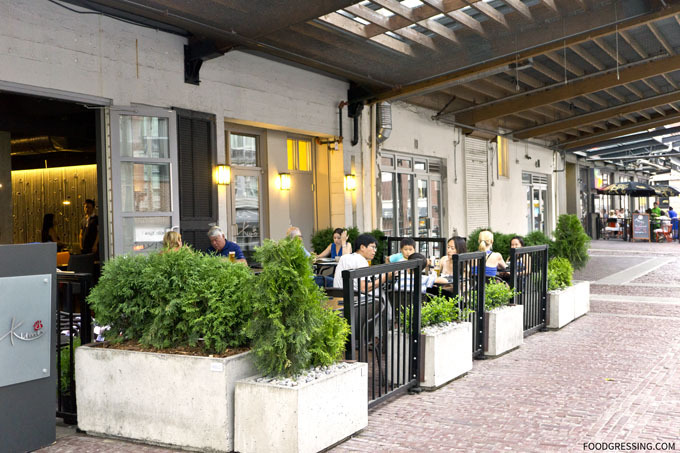 The quiet part of Yaletown, located on Hamilton between Davie and Homer streets, recently welcomed a slew of new restaurants. 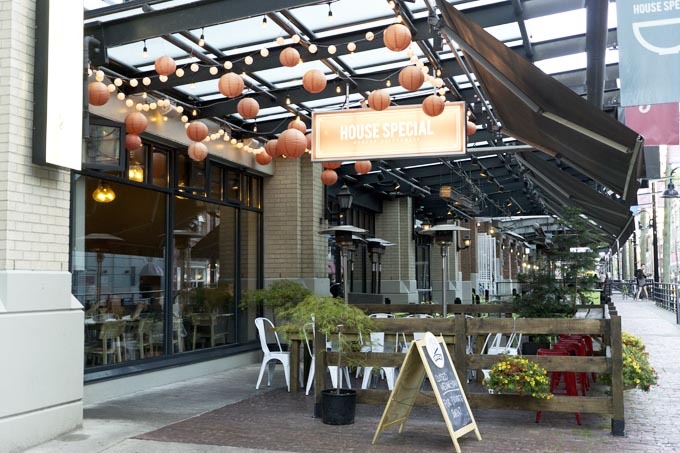 New openings include modern, upscale Vietnamese eatery, House Special, as well Asian fusion seafood restaurant, 21 Nautical Miles. 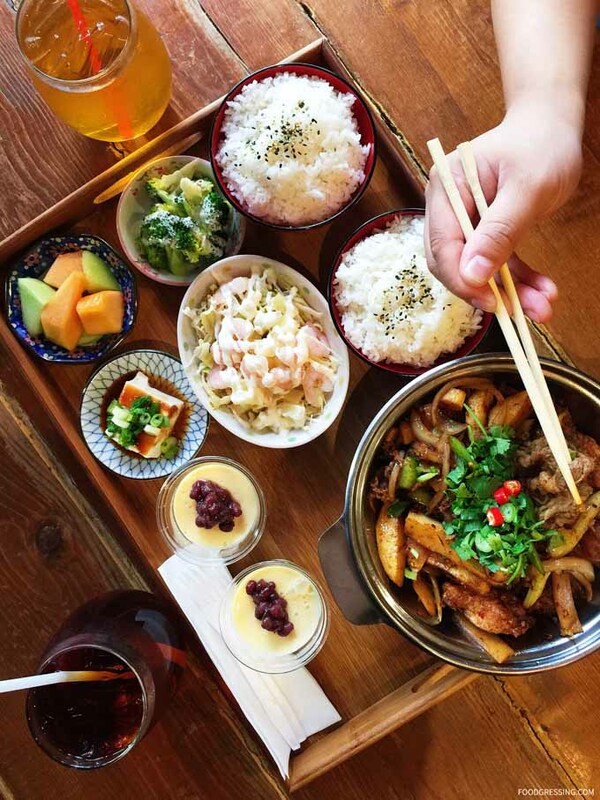 Newcomer Kuma Izakaya at 1233 Hamilton Street is bringing French flair to Japanese and Korean dishes. 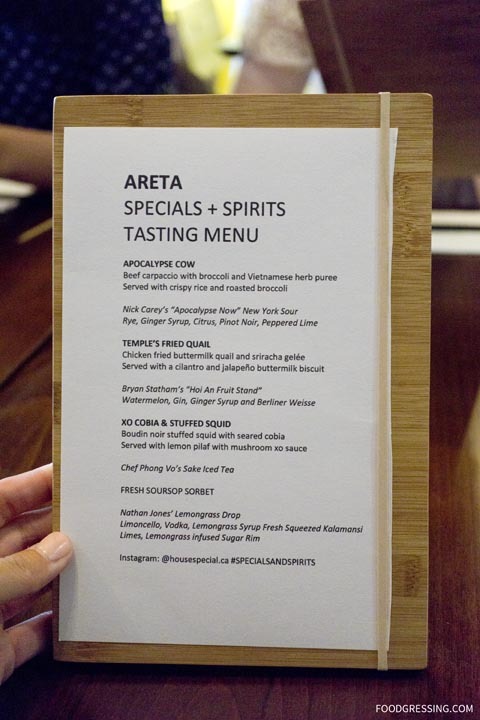 I recently attended a media tasting at Kuma Izakaya where I learned more about their story and tried several of their dishes. 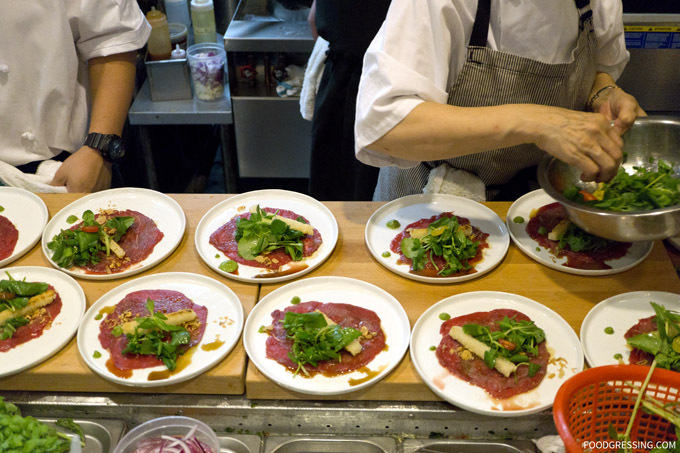 Kuma Izakaya is chef-owned and operated by Hyun Woo Kim, who is originally from South Korea. 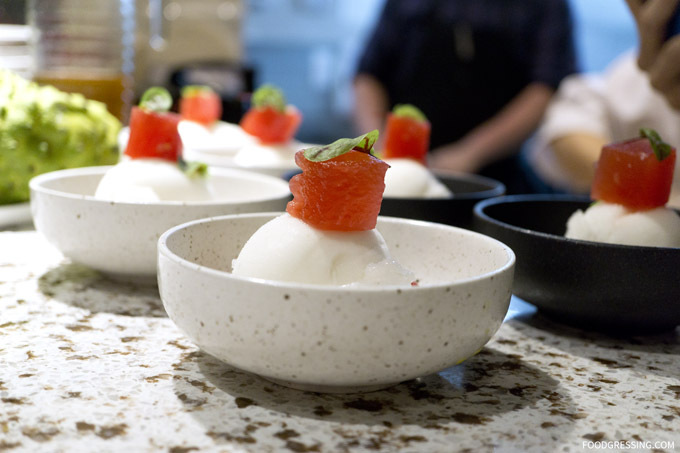 Chef Kim’s background includes working at restaurants in Europe and locally at the popular Miku restaurant in Coal Harbour. 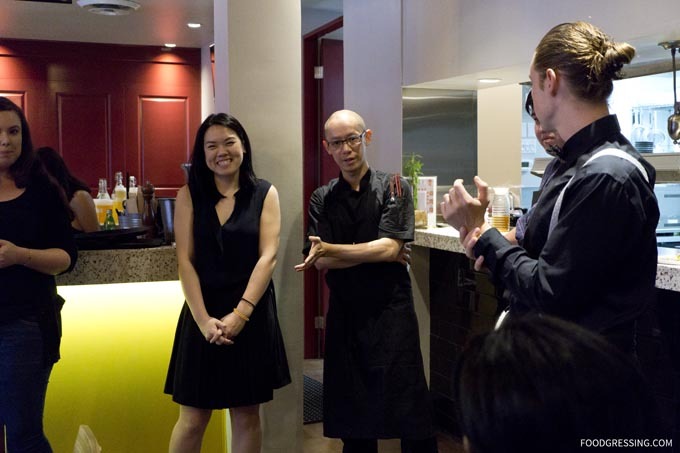 Most notable, however, is his experience from working at the three-Michelin-star restaurant, The French Laundry, in Napa Valley. 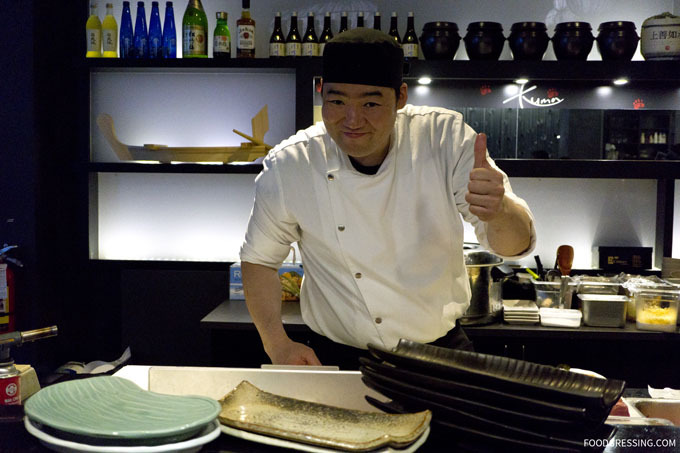 With his diverse culinary background, Chef Kim opened Kuma Izakaya with a menu that has also a number of influences including Japanese, French, Korean and Italian. 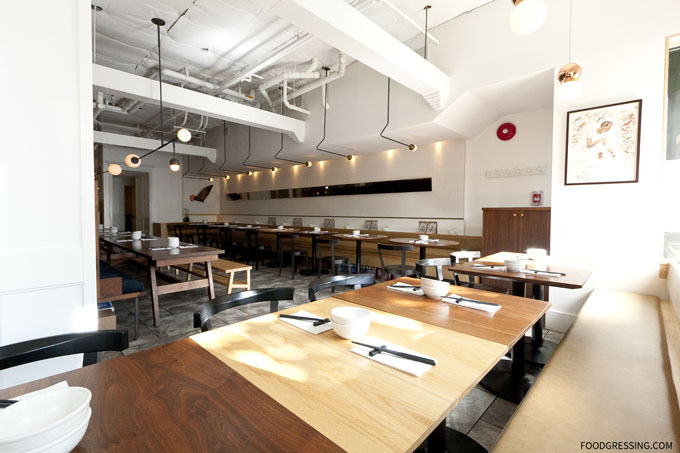 Kuma Izakaya’s interior has a lounge feel with cozy banquettes and a few long tables. 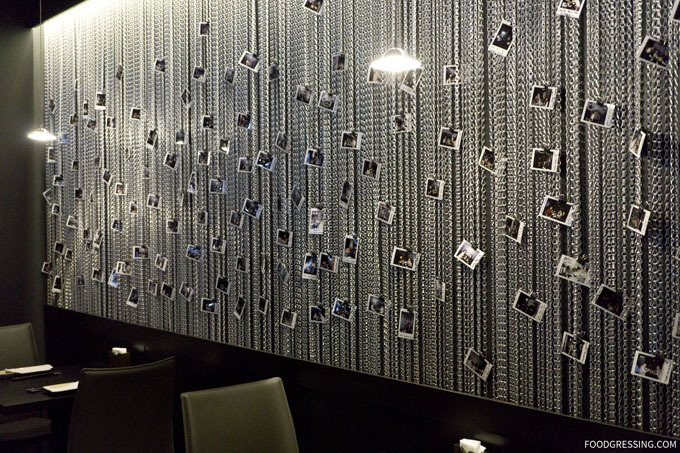 One unique piece of decor is the chain curtain that adorns the walls with instant photos of their customers. 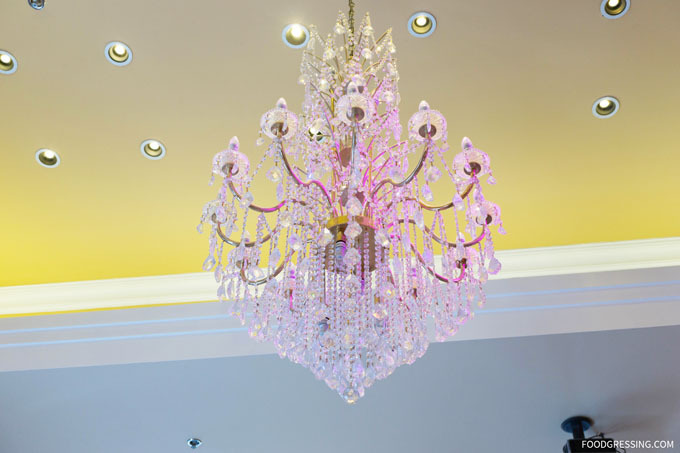 The inside can accommodate about 50 diners, but on a lovely day, you might just want to sit on the patio which can hold up to 30 people. 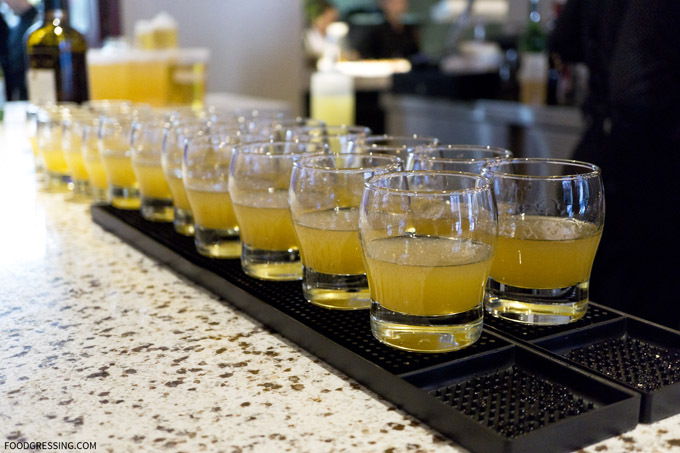 Kuma Izakaya has several different flavours of soju. 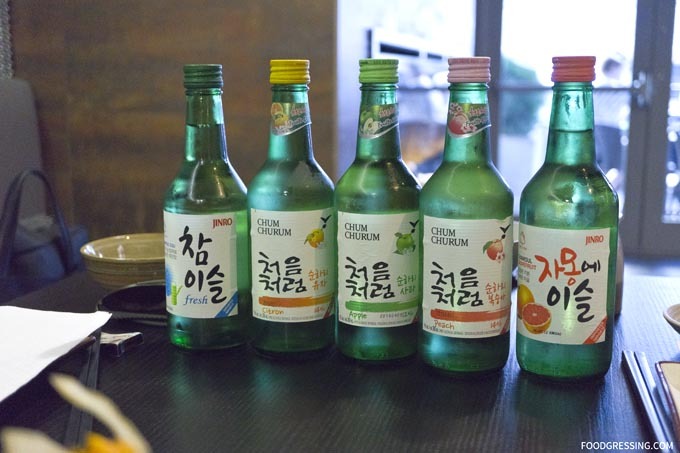 There were some nice fruity flavours including apple, peach, grapefruit and lemon. 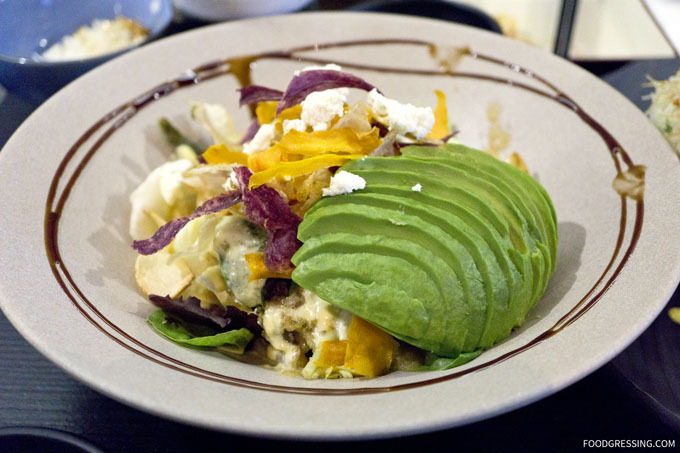 To start, we had the Kuma Signature Salad made of fresh greens topped with sliced avocado, sliced tomato, pickles, housemade ricotta cheese, and crispy yam. There was a mix of crispy yams (purple, white and yellow) and I loved how they added a fun texture to the salad. I enjoyed the balsamic and house dressing mix which was tangy and slightly sweet. 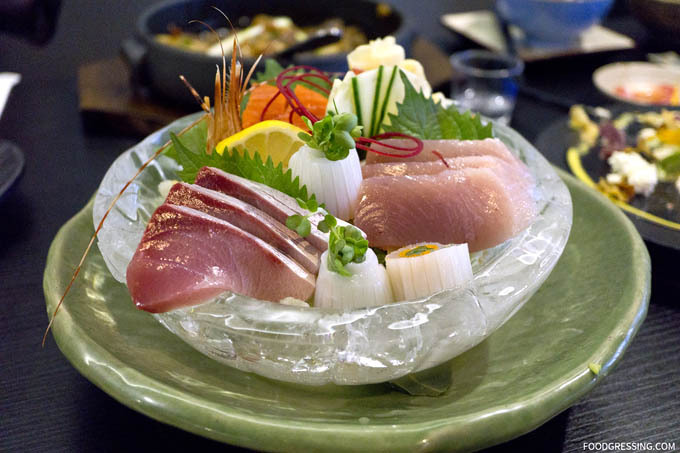 Assorted sashimi (sockeye salmon, albacore tuna, hamachi, and amaebi) were presented in a lovely ice bowl. 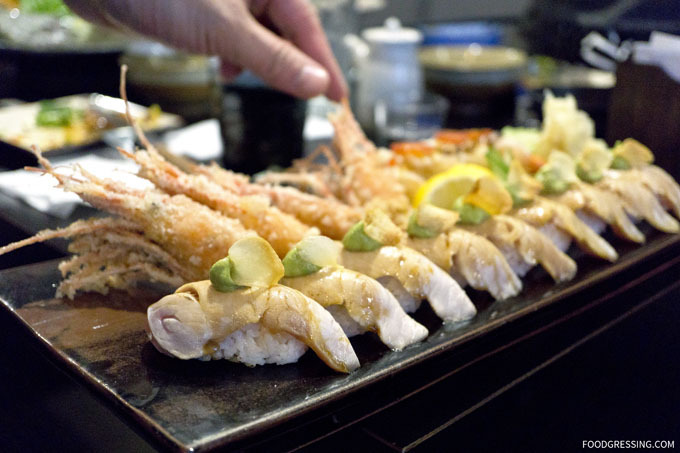 The lustrous, glistening sashimi had a wonderful clean taste. I was in sashimi heaven. 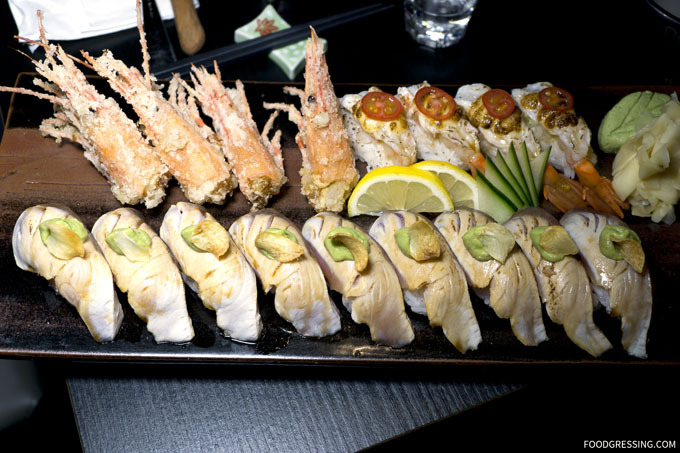 The assorted aburi nigiri (hamachi and amaebi) came on a beautifully arranged platter. 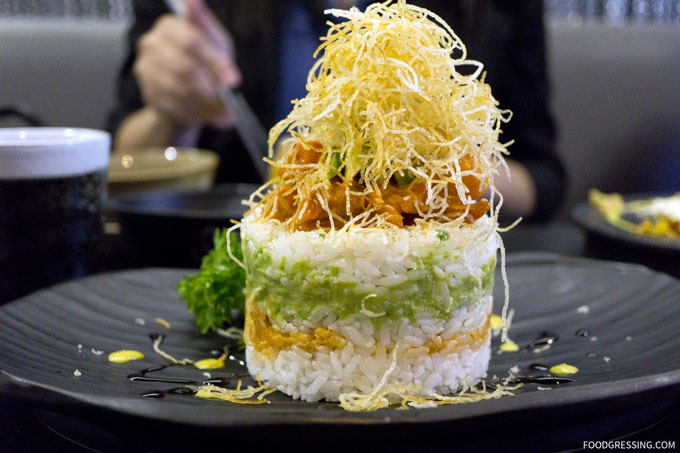 The sushi rice texture was on point and the raw fish had a wonderful clean taste. 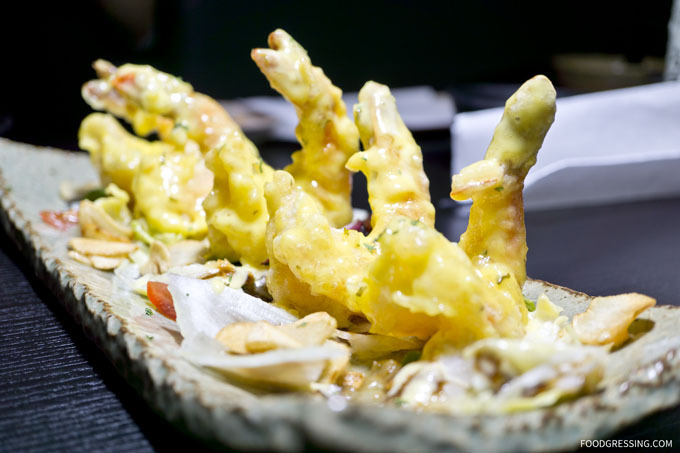 The fried ebi was very crunchy and provided my daily dose of calcium! Kuma Chirashi Tartare was very reminiscent of the one served at Miku. It was an aesthetically beautiful creation of balsamic spicy aburi tuna and assorted sashimi served atop of warm sushi rice. 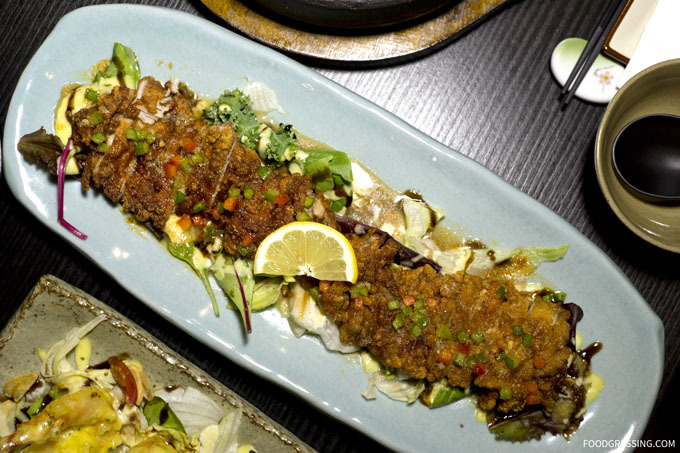 Garnished with tenkatsu and yam flakes then drizzled with avocado dressing. It had a spicy kick though not too overwhelming. The Mango Ebimayo (deep-fried prawn with mango sauce) was super tasty. 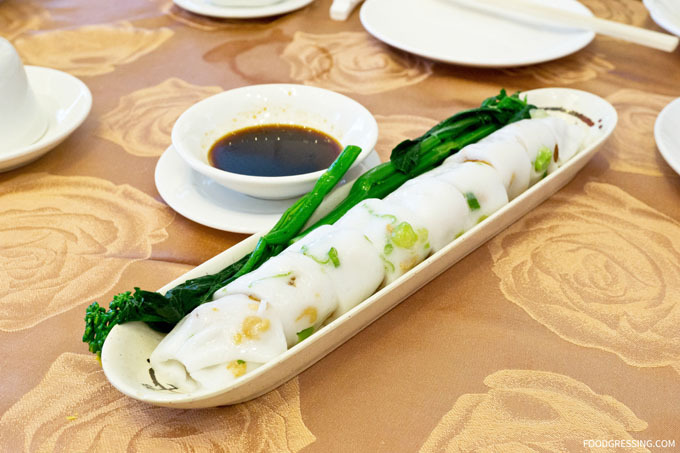 The sauce was rich in flavour and a lil’ sweet and savoury. 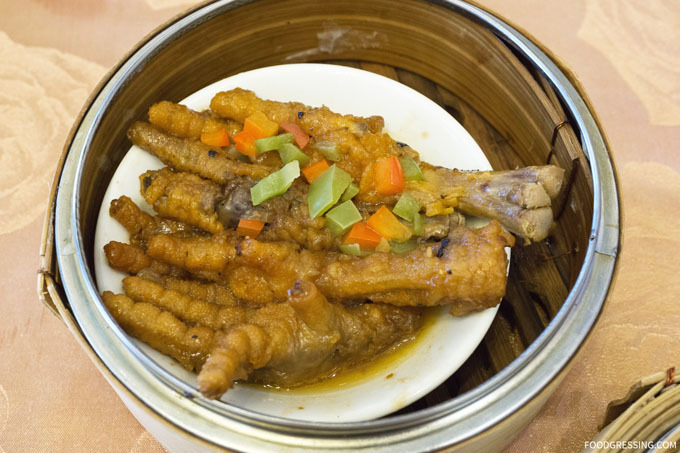 The Crispy Chicken came on a very long dish, which makes it good for sharing. Deep-fried boneless chicken with pan-fried veggies and Korean-style sauce. I experienced a mouthful of flavour with each bite. 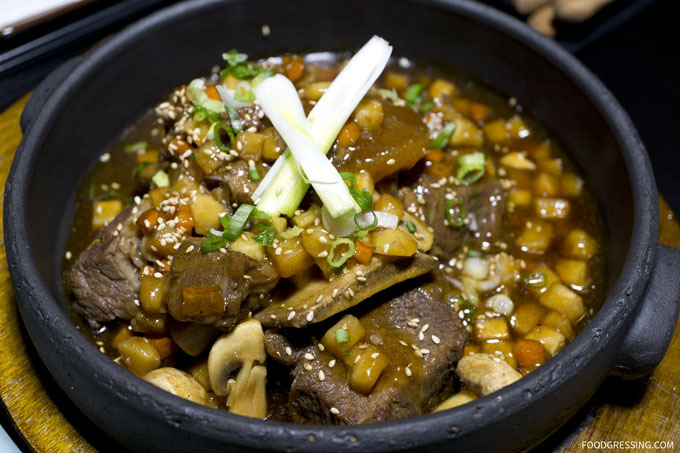 The Osso Buco with premium AAA beef ribs simmered in house made oriental soy sauce was a favourite at our table. The savoury sauce was just delicious and left me lingering for more. 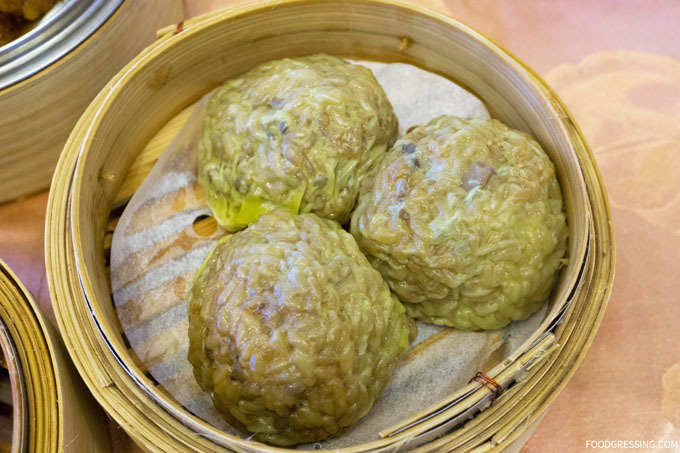 I did think that the beef texture could be improved because it was a bit tough and chewy. 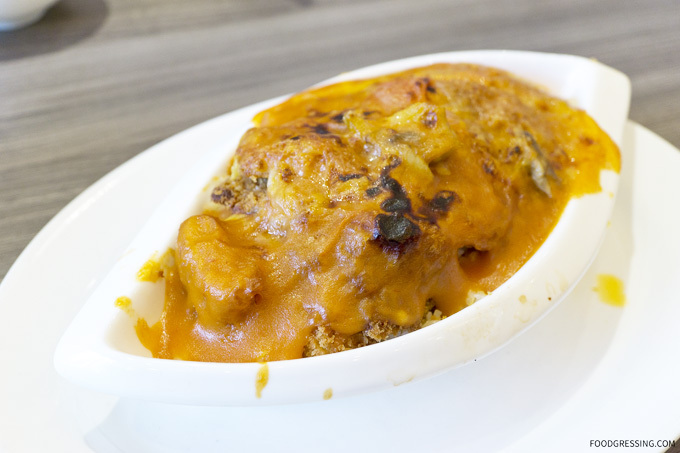 An overall comforting dish. 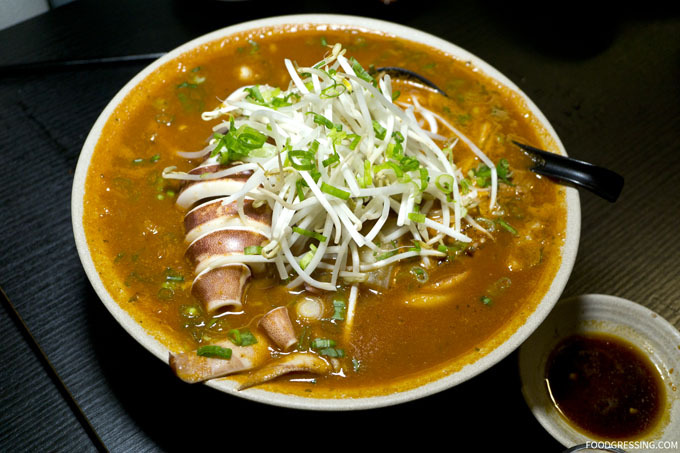 Another hearty dish was the Kuma Seafood Champon which came in a rich, flavourful tomato seafood udon soup. 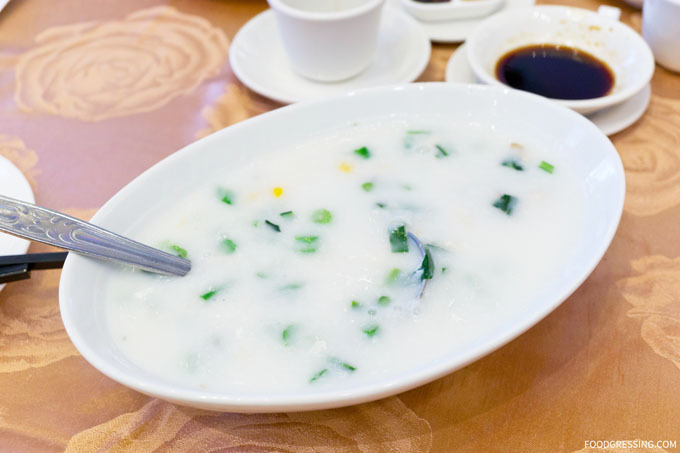 The soup had been simmered with assorted pan-fried vegetables, chilli oils, and chilli powder. To finish off a fantastic meal was the house made tiramisu. It came in glass jars which could easily mistaken for chocolate cups. It didn’t taste quite like the authentic tiramisu but nonetheless a refreshing creamy pudding dessert. 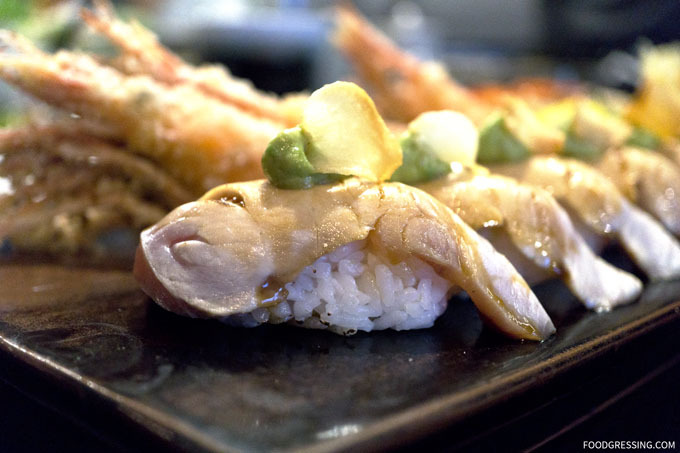 All in all, I enjoyed Kuma Izakaya’s Japanese and Korean dishes with some European twists. 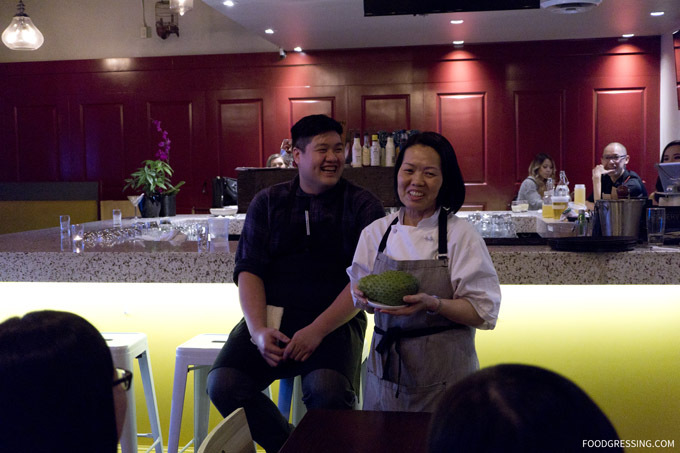 There’s a lot of potential and Chef Kim seems to be eager to refine his menu based on the tastes of customers. 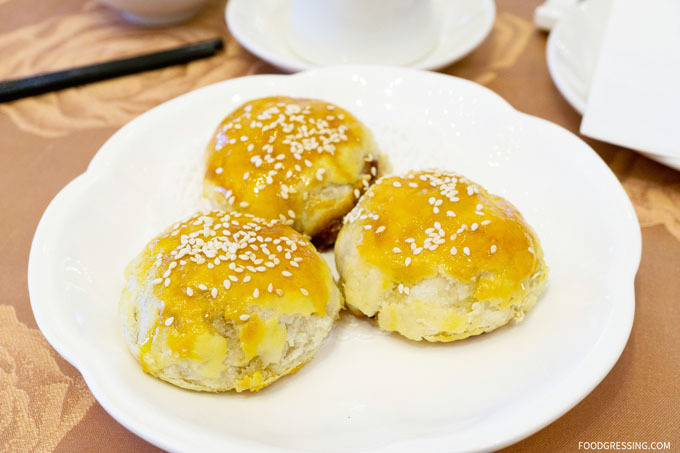 After my post with Vancity Buzz on the Best Mango Desserts in Vancouver, some friends were eager to try out desserts that I had recommended. These friends are not usual dessert-goers so the list really tempted them to try out mango delights. We decided to go on a Friday night to Icy Bar where the mango ice cream icy is one of my top picks. 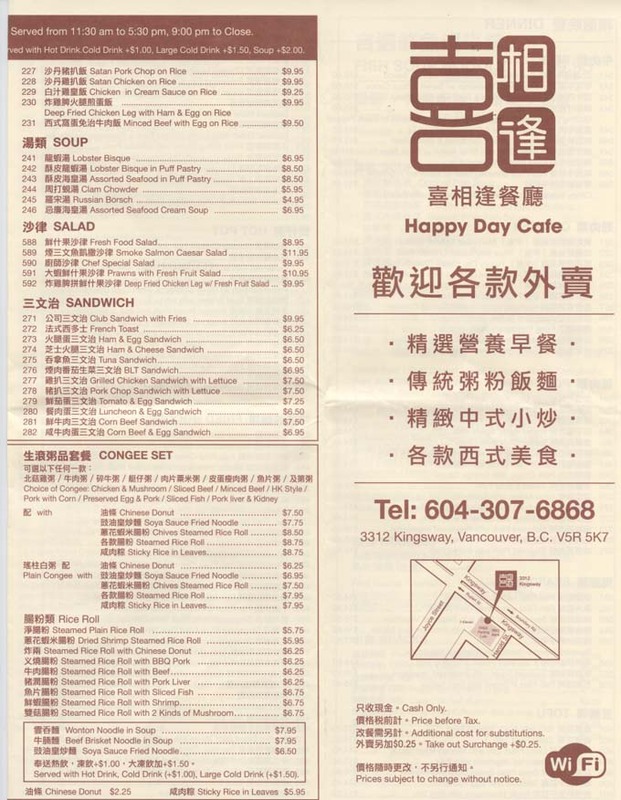 Since I had been to the Icy Bar at Kingsway and Boundary before, we went to a different location on Kingsway and Knight. 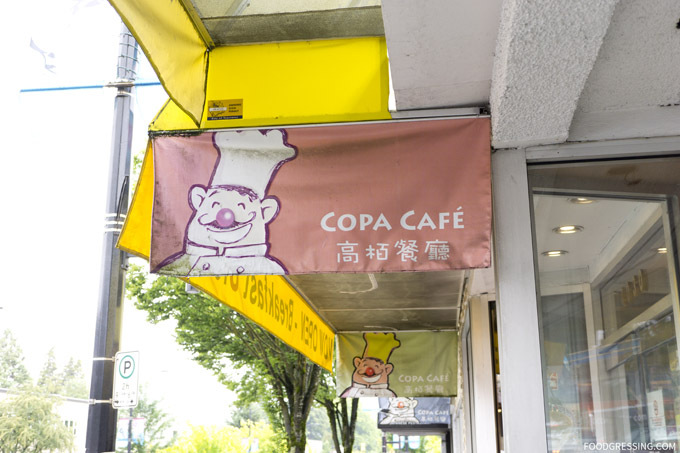 They are known for their shaved ice desserts but they also have drinks, fresh tofu pudding, tapioca desserts, hot sweet riceballs, and plant puddings. 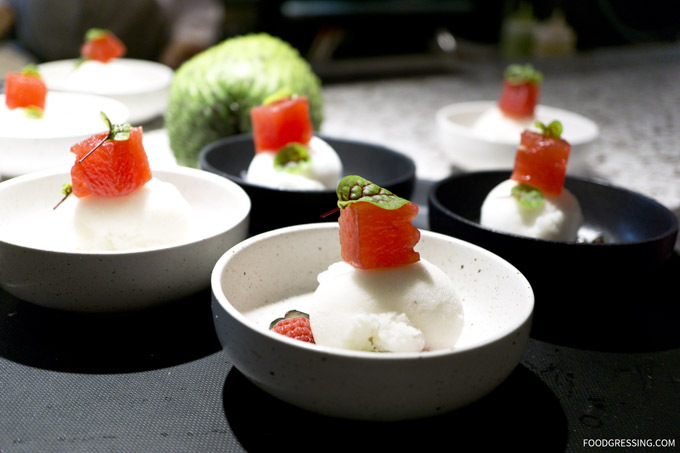 The fruits that they incorporate into their desserts are fresh cut every day. 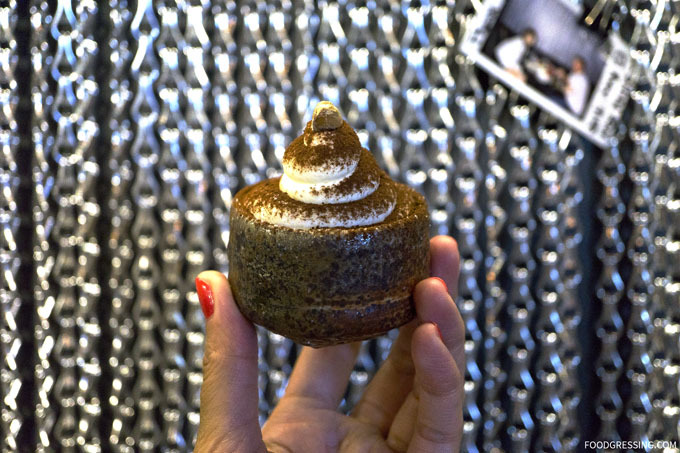 Their mochi are made from scratch. Their pancakes are made fresh every day. 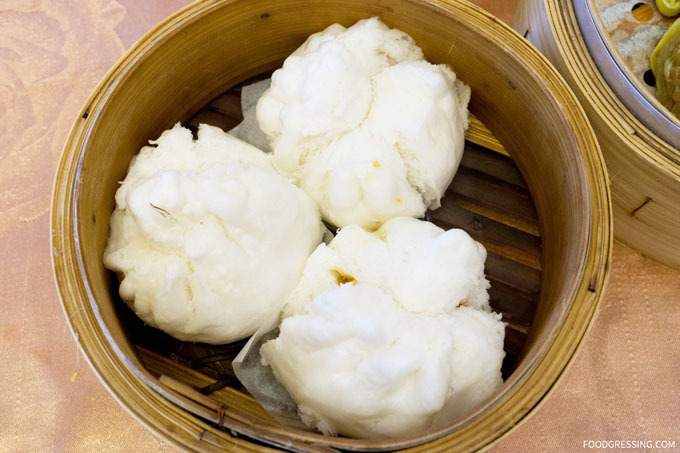 They have multiple locations: Kingsway & Knight, Kingsway and Boundary, Parker Place, Crystall Mall, Richmond Night Market and No. 3 Road. The minimum per person is $3.50 and the maximum seating time is 2 hours. On our mango-themed food adventure, we had the mango ice cream mochi icy ($10). This dessert is definitely one that can be shared between multiple people given the portions. 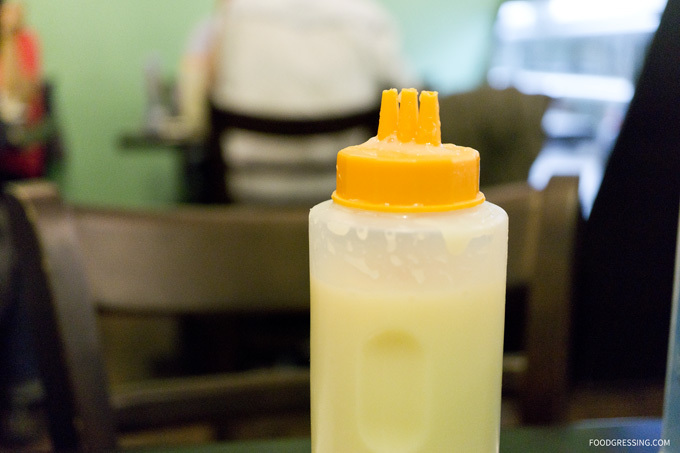 It was really nice that the condensed milk came on the side. 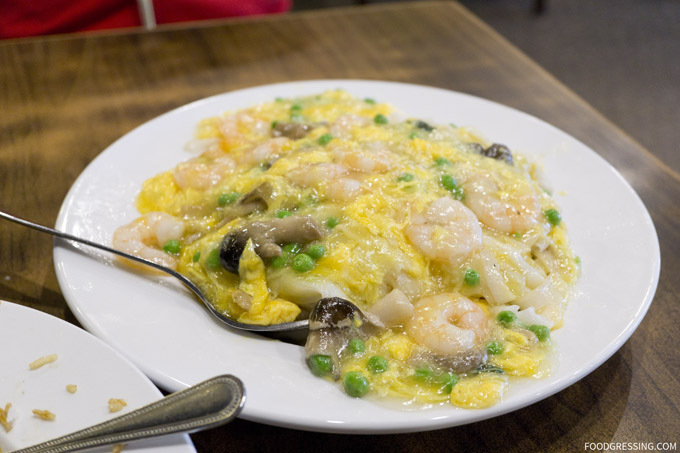 My friend very much enjoyed dousing his section of the dish with it. 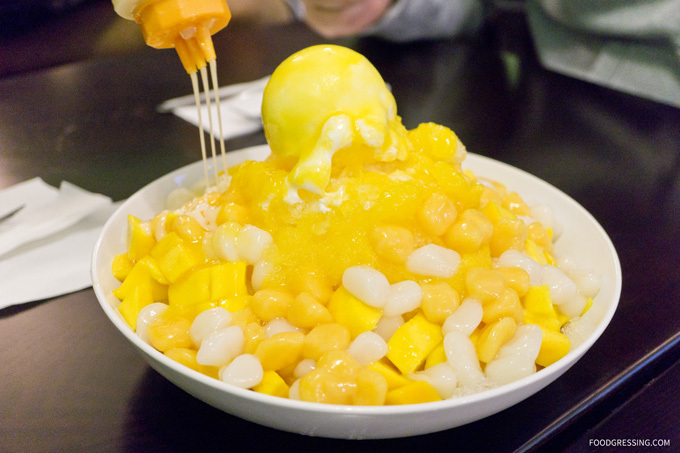 Lots of great mango flavours and nice to have that melting vanilla ice cream on top. The mochi tasted wonderfully fresh and chewy. Absolutely loved it. 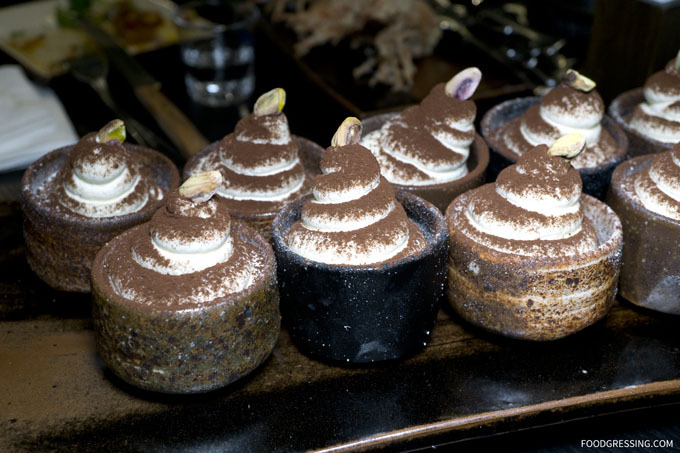 You’ll be savagely attacking this dessert once you see it. We also had the mango and strawberry pancakes (2 for $7). 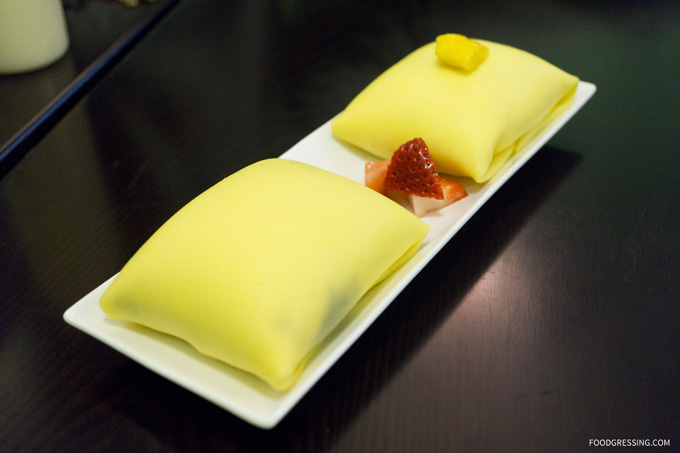 These pillow-y snacks are crepes filled with whipped cream and the fruit of your choice including mango, strawberry and nutella, and durian. The pancakes tasted fresh and had a nice of proportion of fruit versus whipped cream. 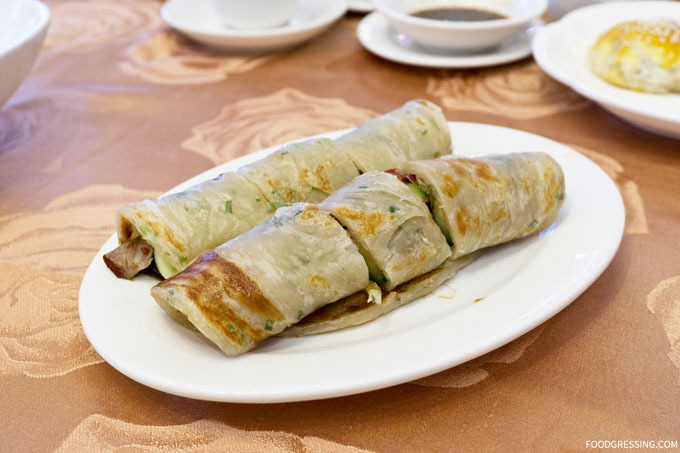 The crepe is very thin but still holds the fillings well. 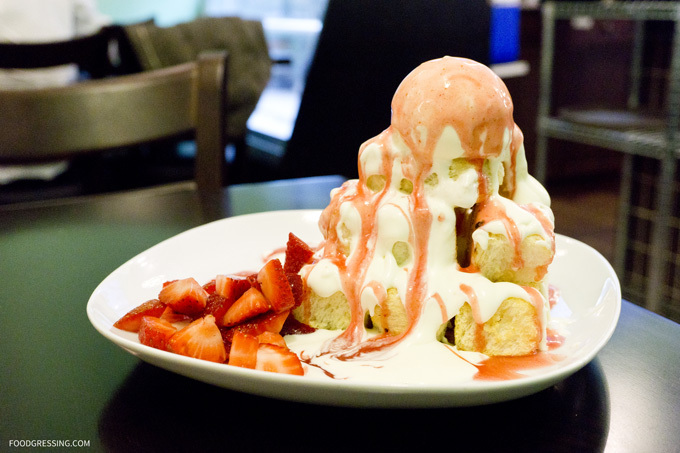 We also tried a non-mango dish: the strawberry honey toast. It was a mouthwatering sight of vanilla ice cream on top a pile of cubes of white bread that had baked in a honey mixture. Really really yummy. This particular Icy Bar location is smaller than the one at Kingsway and Boundary. There was a bit of a wait when we got there but I can imagine that the wait would be very long if you had a large group. That would be because you would need to wait for multiple tables to be available. Service was not optimal. It’s the kind of place where you need to go to the front to order, pay and get anything else you need. I even had to go to the front to ask for glasses of water. For more mango desserts I have tried, follow the tag mango or see the Vancity Buzz article on Top Mango Desserts in Vancouver.